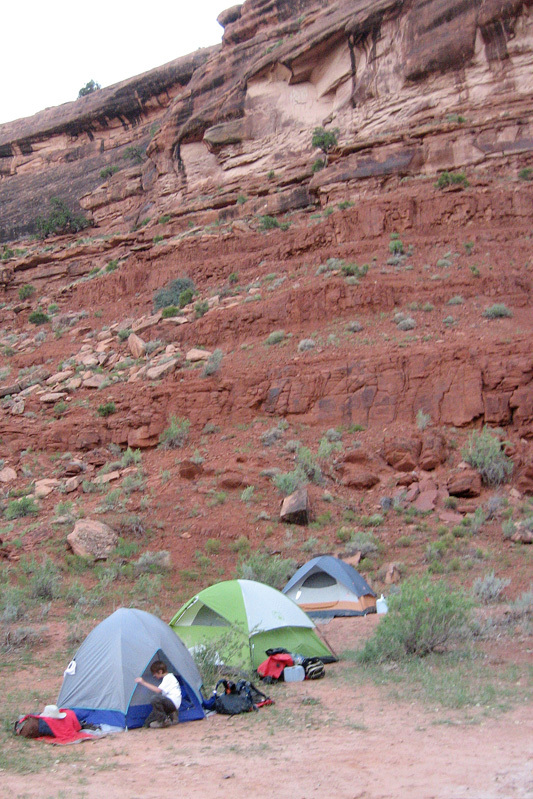 This year the camping group decided to step it up from car camping to something more challenging. 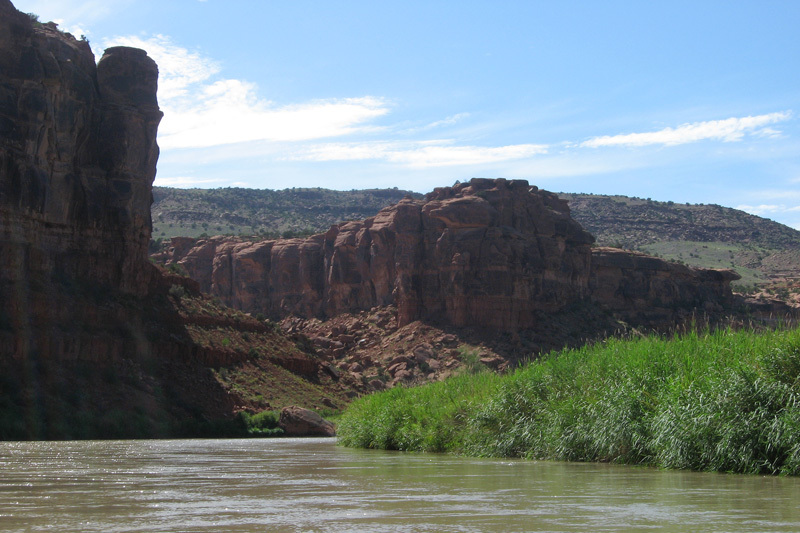 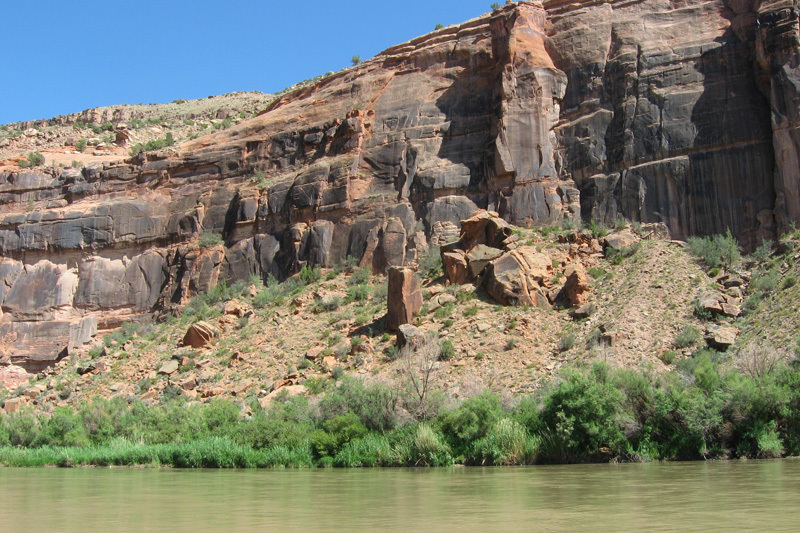 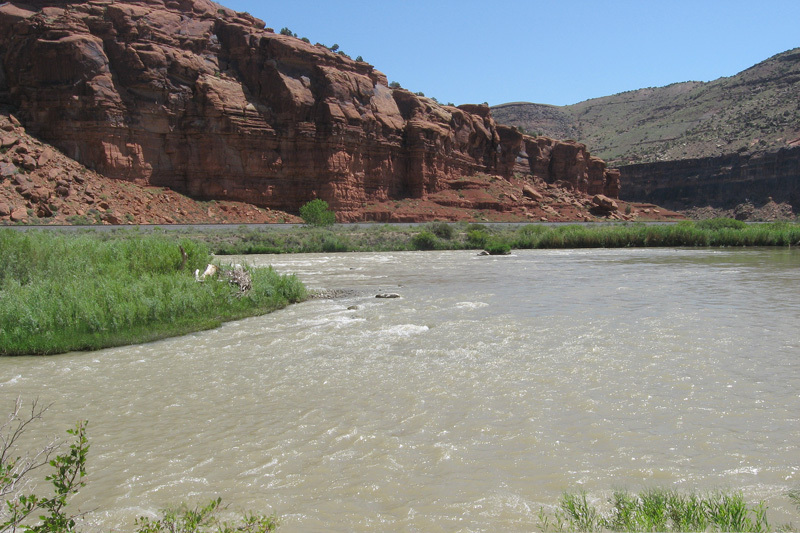 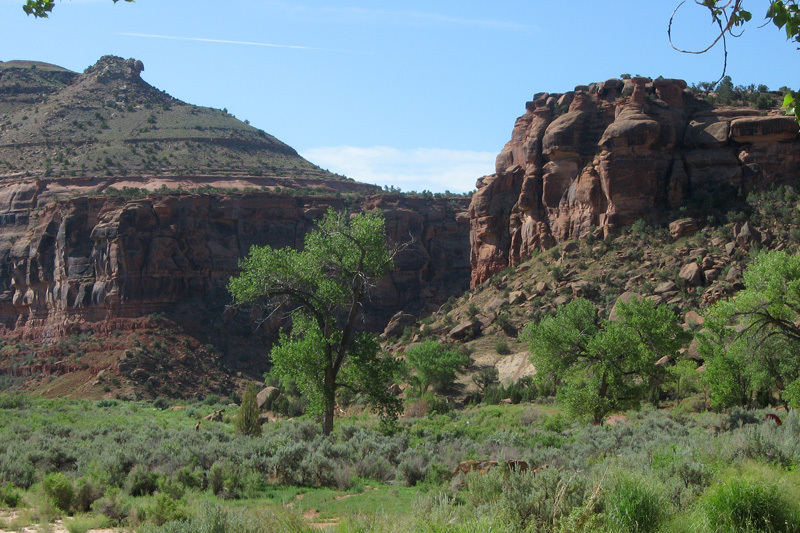 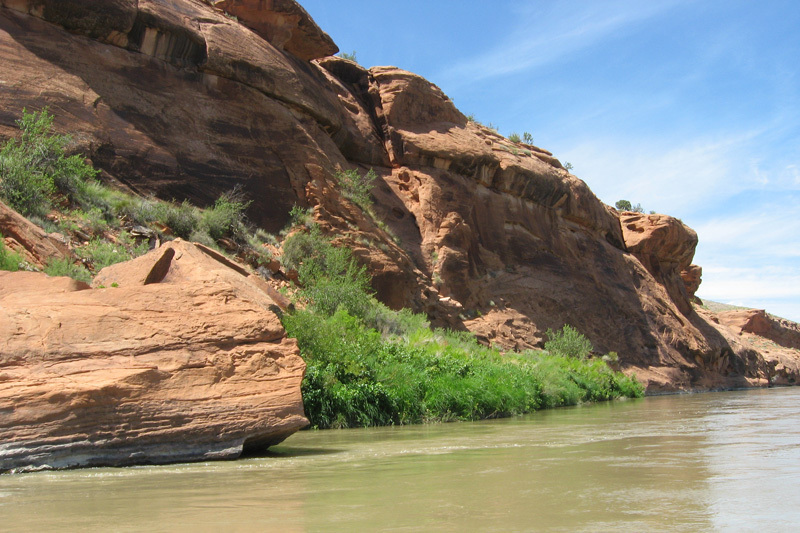 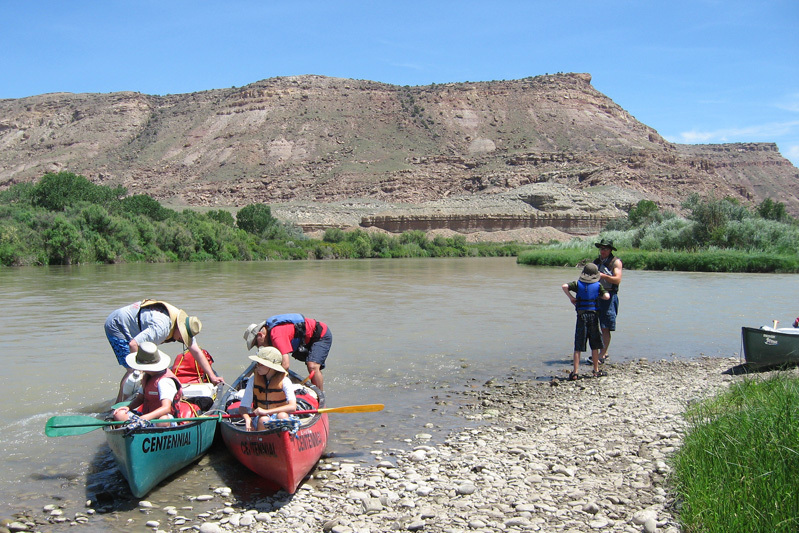 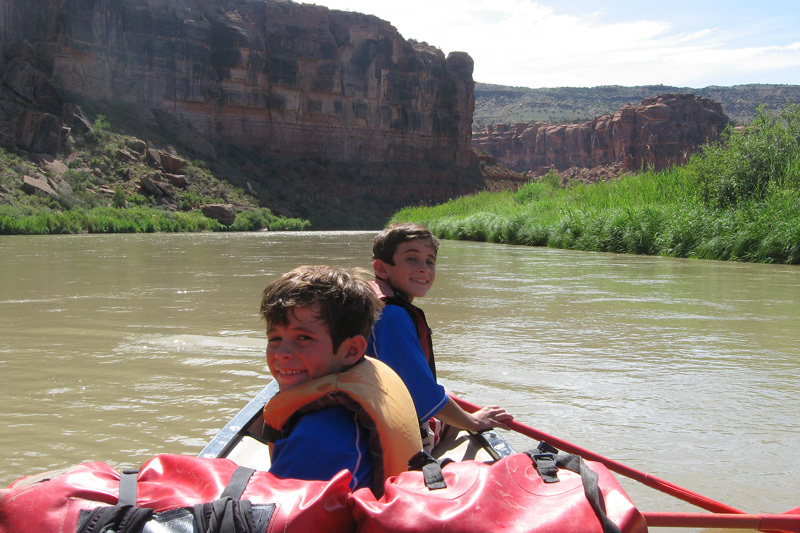 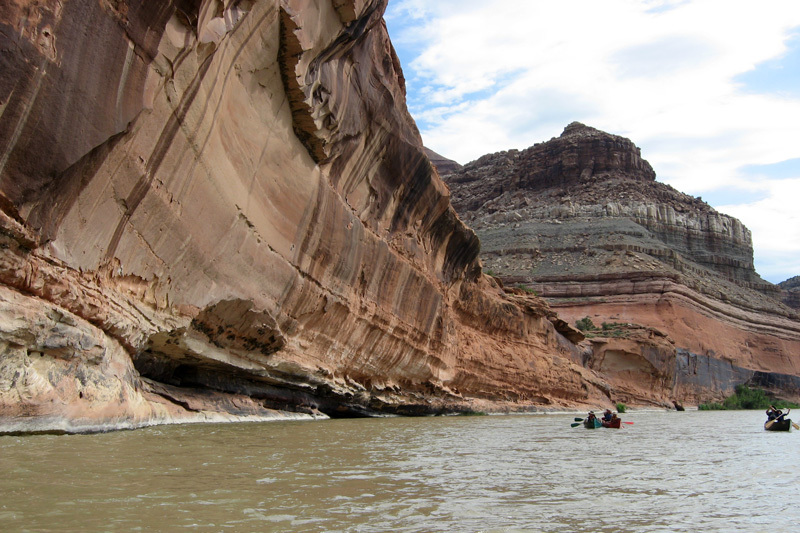 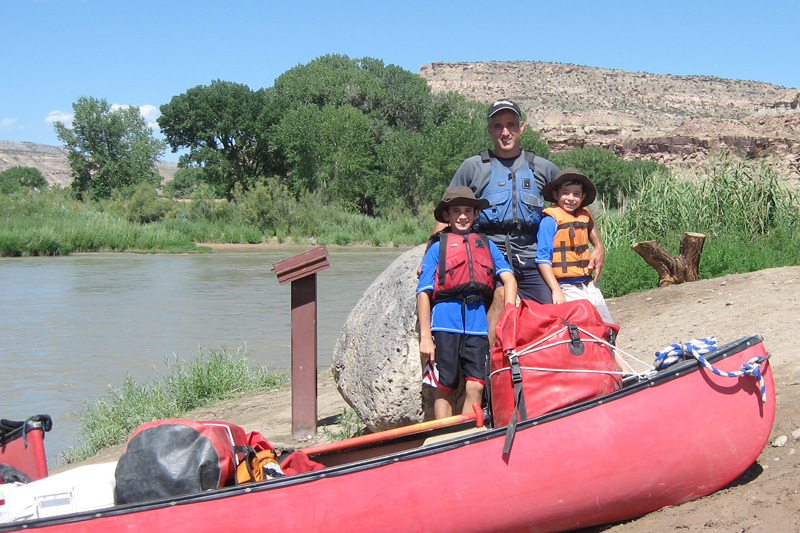 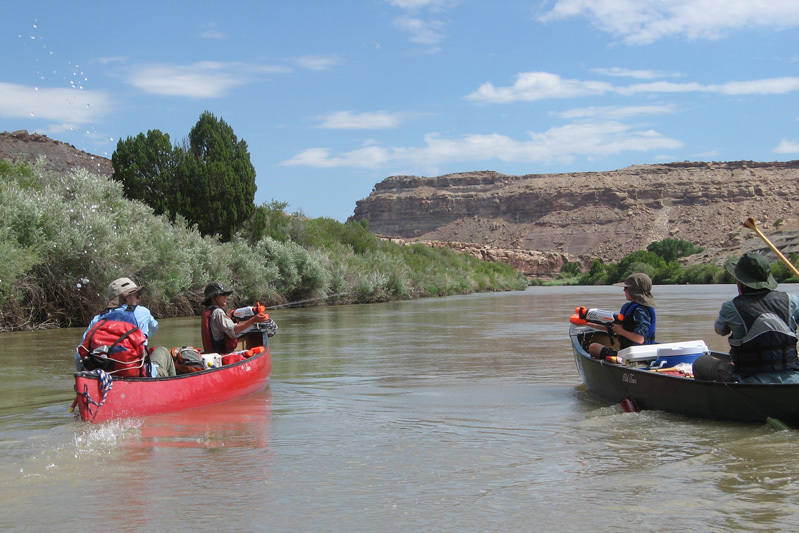 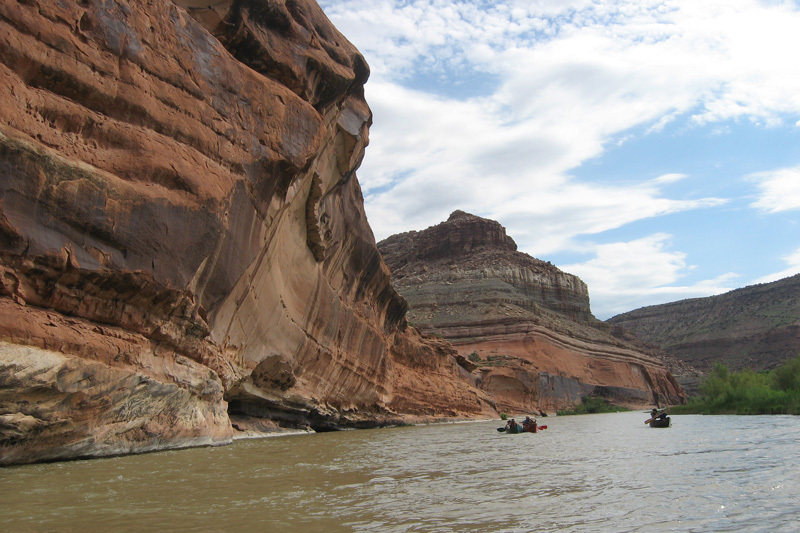 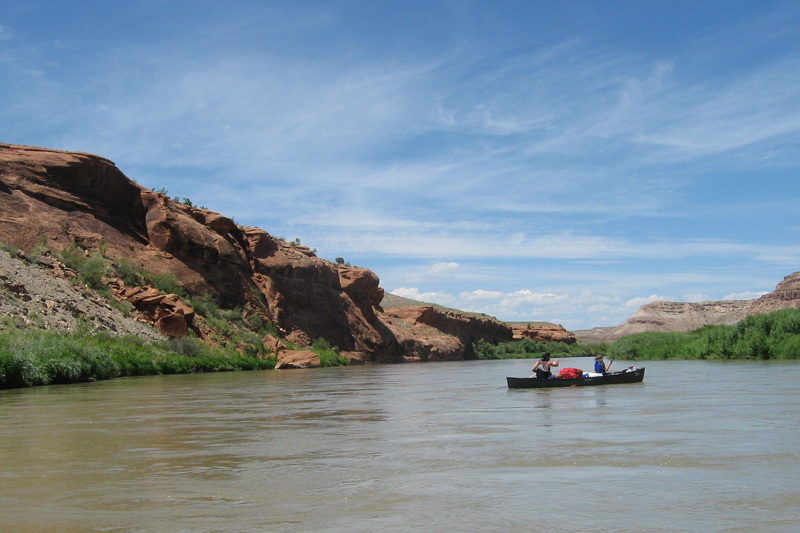 Thanks to Bob Wientzen and Centennial Canoe outfiitters we secured an unguided canoe trip on the Gunnison River trough Escalante Canyon to Dominguez Canyon in west Colorado near Grand Junction. 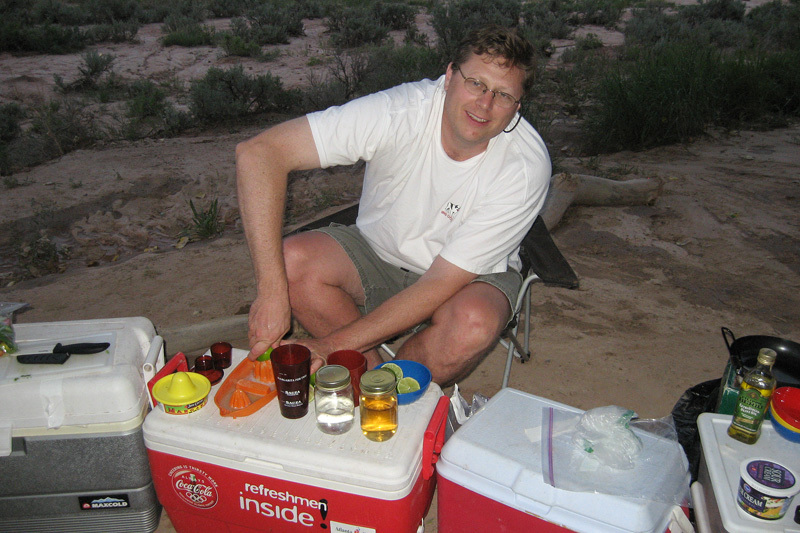 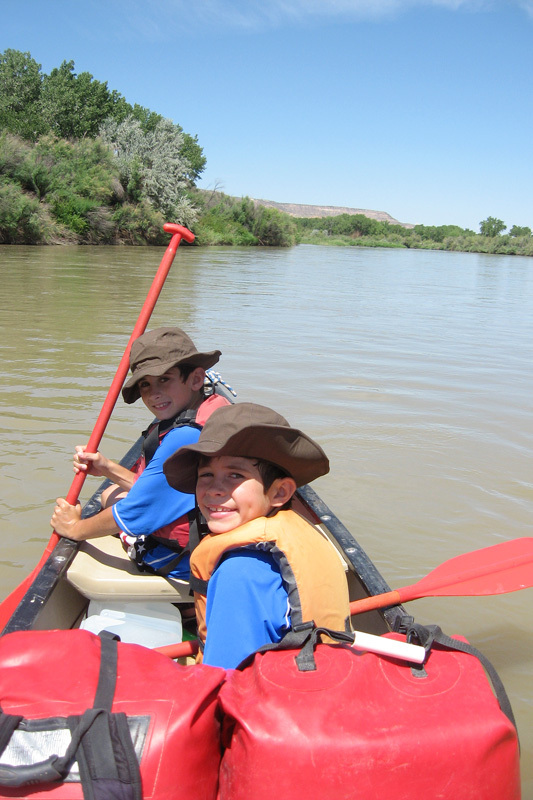 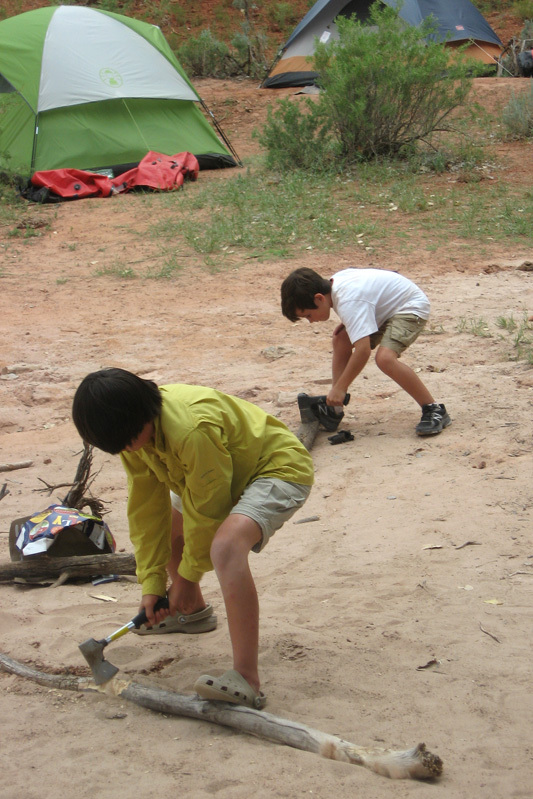 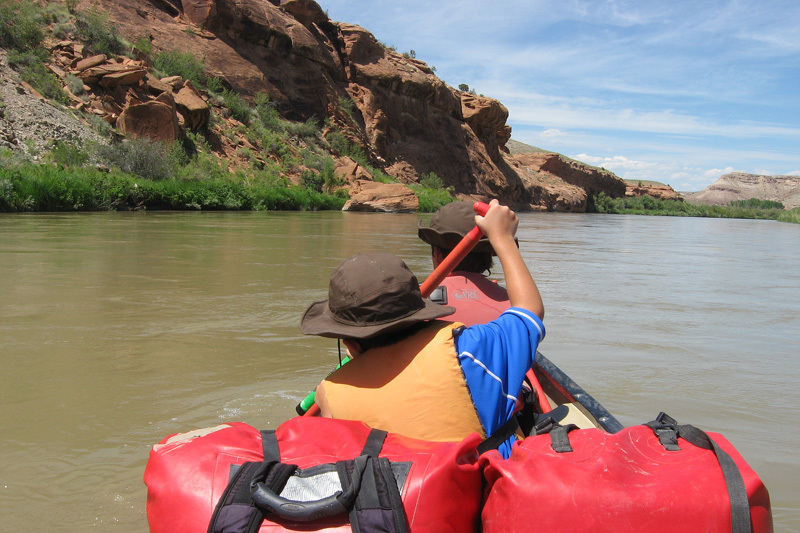 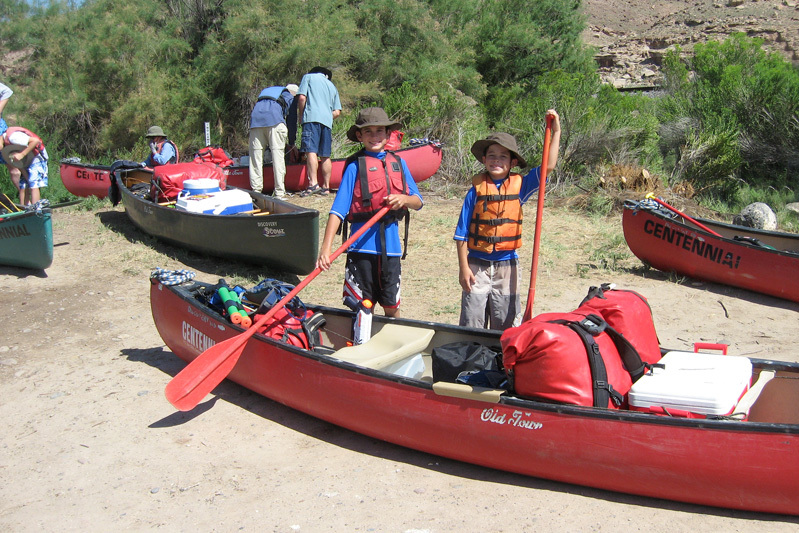 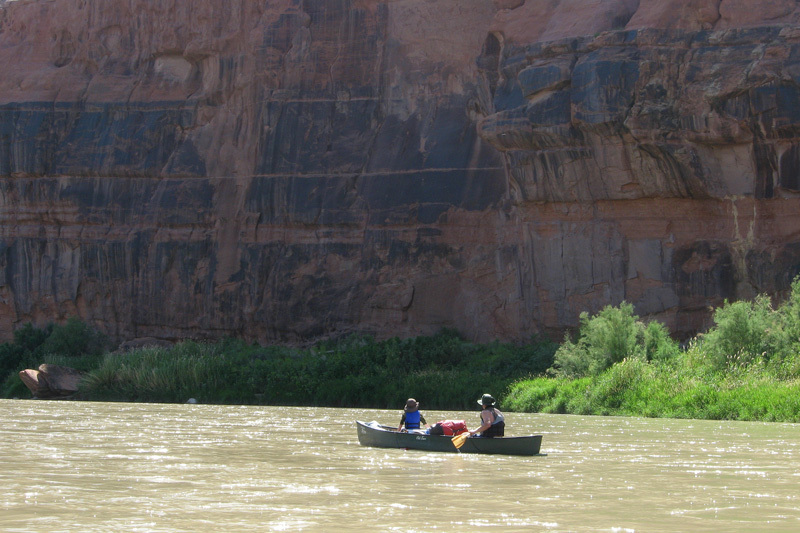 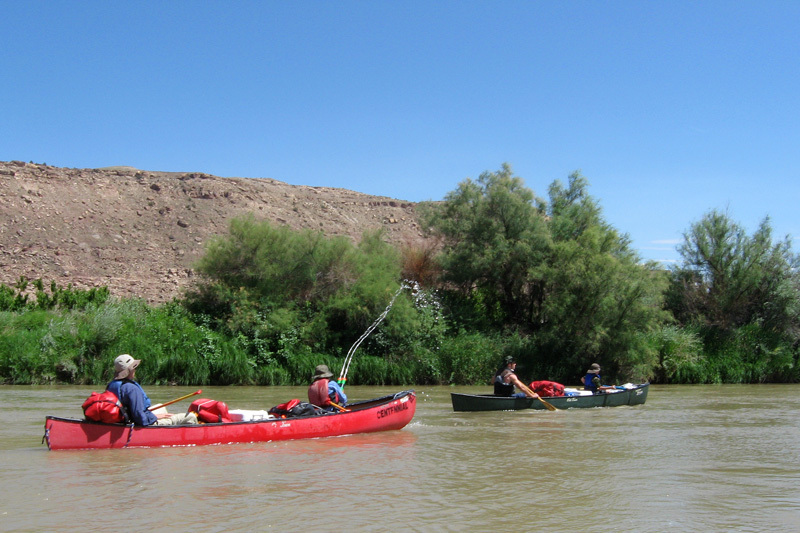 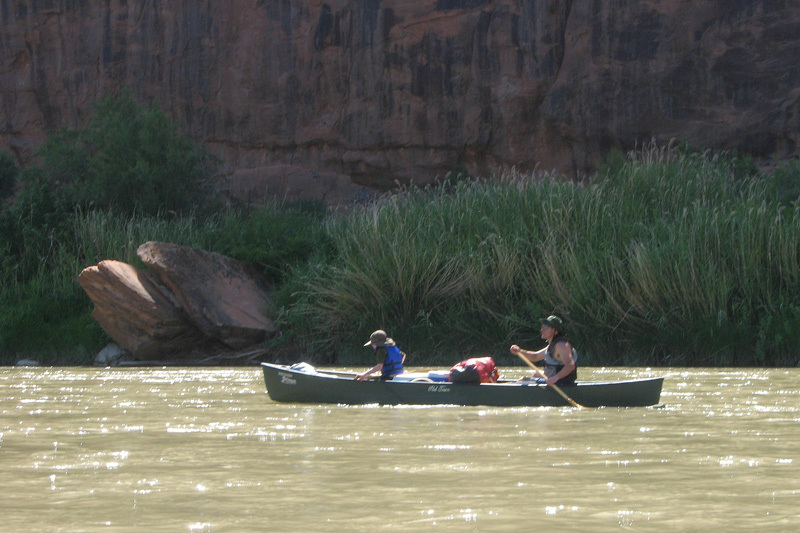 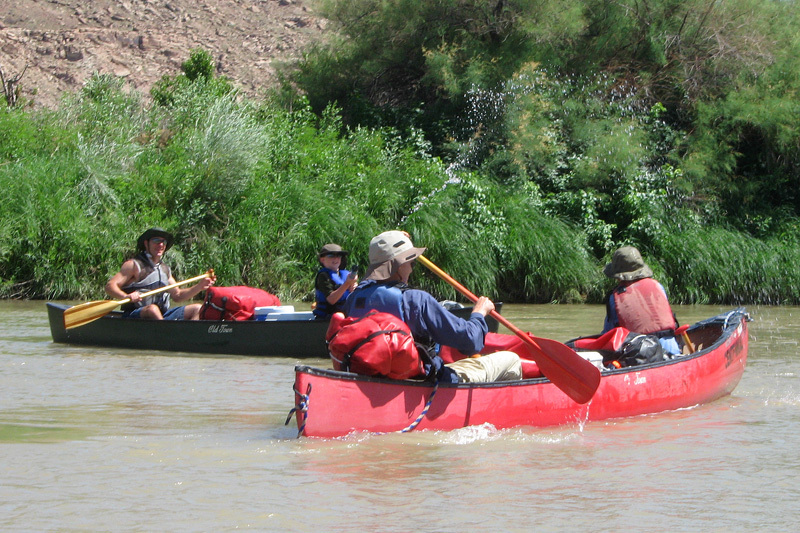 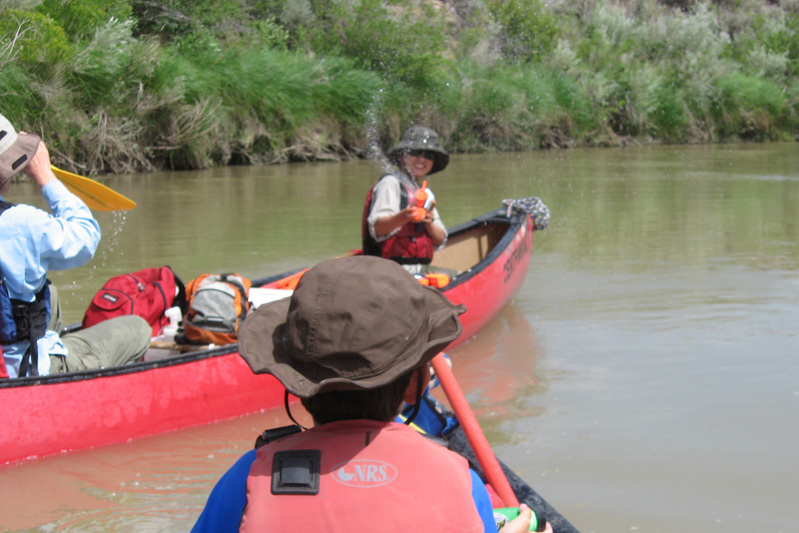 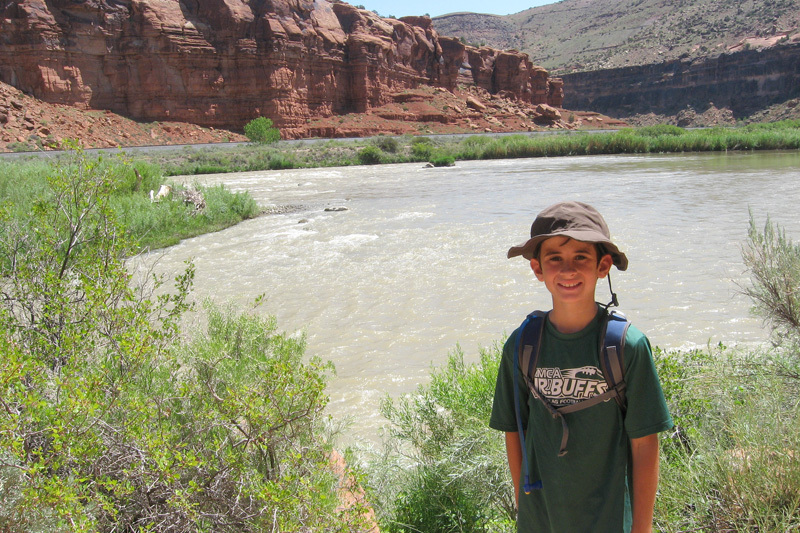 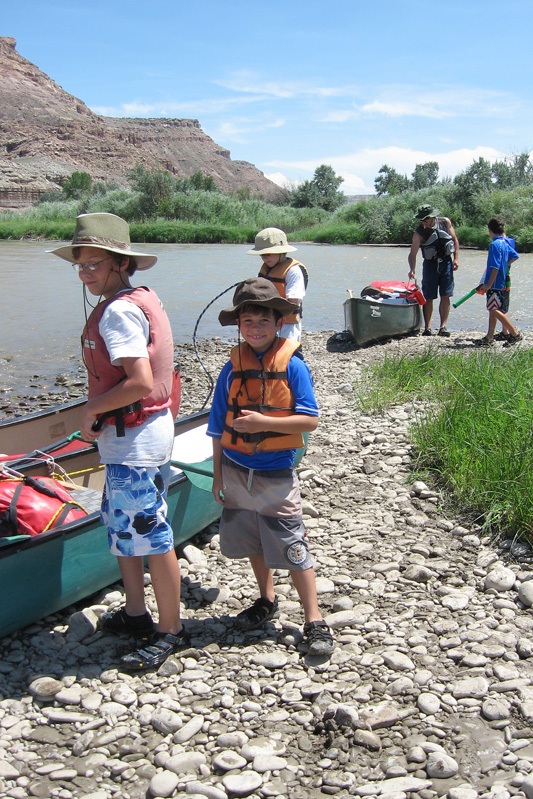 On the first day we loaded our gear into canoes and paddled 15 miles to our campsite at the mouth of Dominguez Canyon. 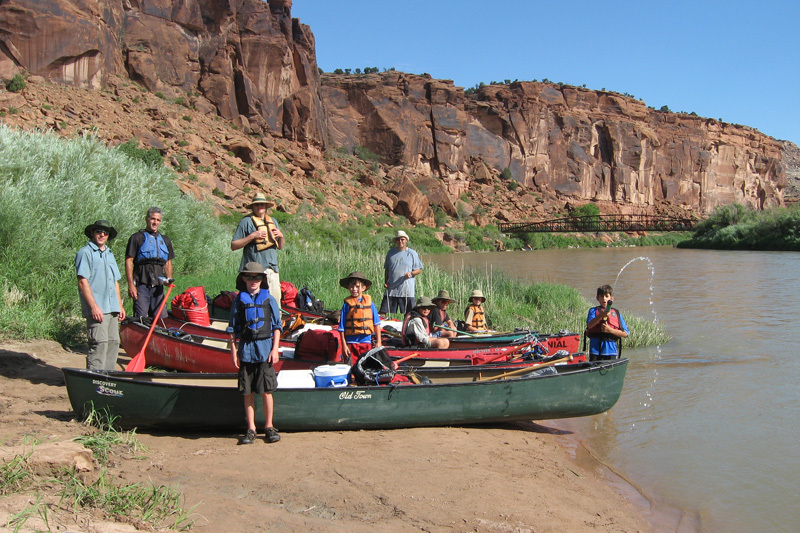 After two days of hiking, swimming and fishing we again loaded up the canoes for a 20 mile journey to the take out point. 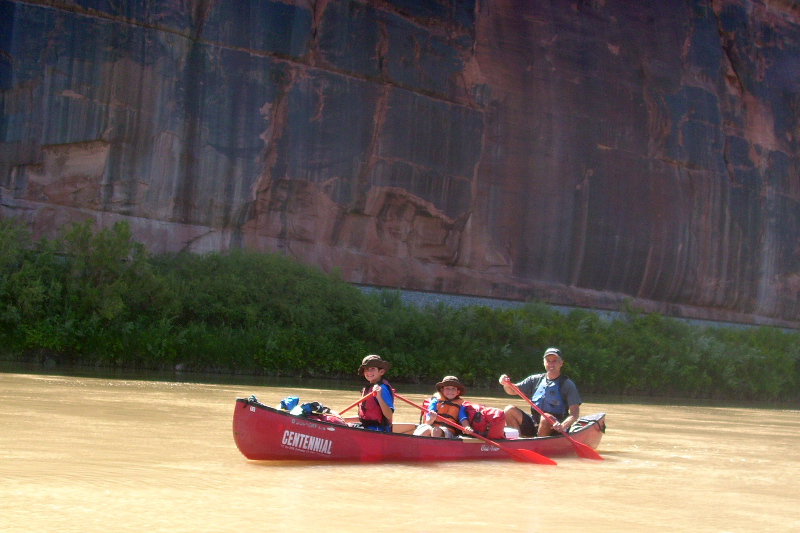 Needless to say this trip was a lot more strennous, but after battling the river, the gear, the heat and the mosquitos we all agreed that the extra hardship actually made for a more rewarding experiencing in the end. 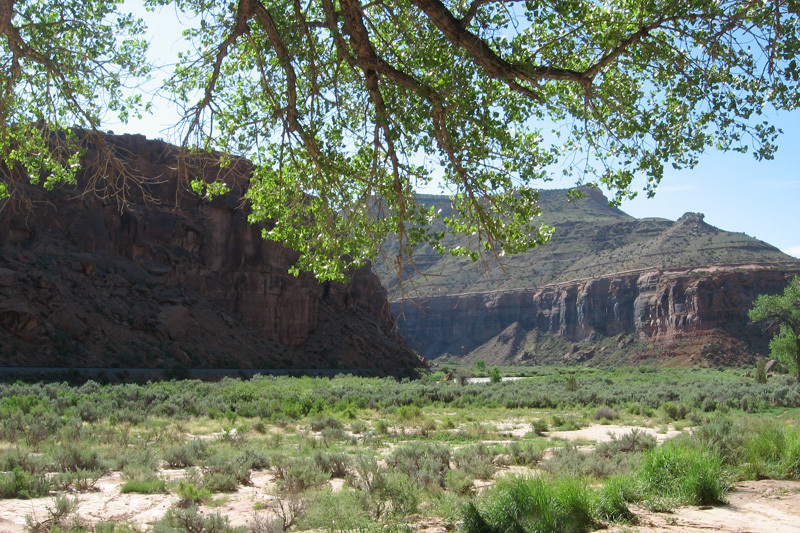 Day 1 - Arriving Dominguez Canyon, first night at camp. 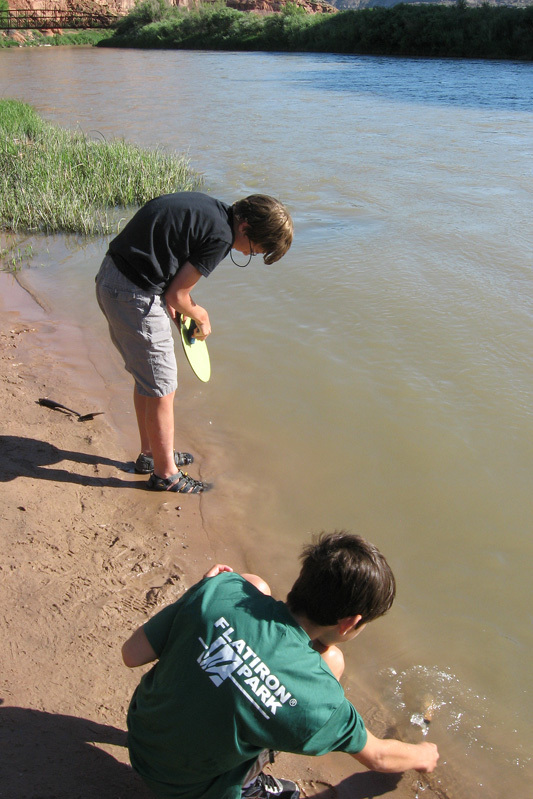 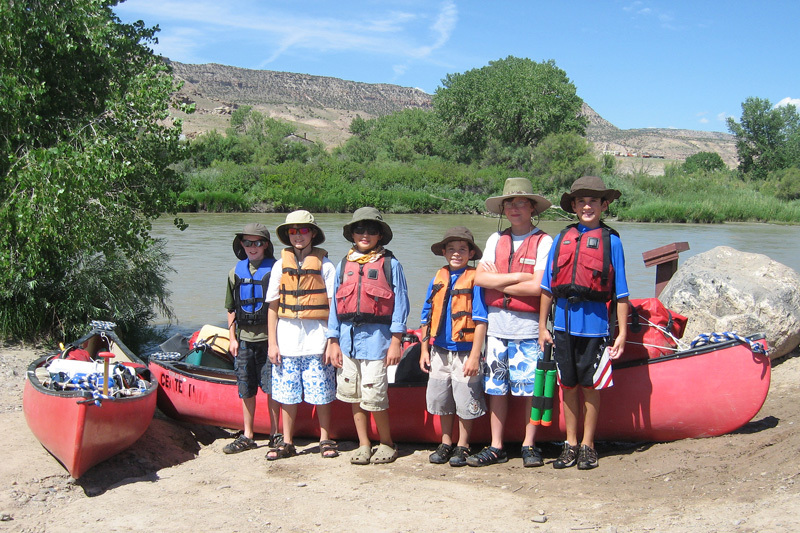 Day 1 - We awoke bright and early at 6:00am on Friday morning (having spent the night in Delta, CO after our drive up from Boulder) and headed to the put in on the Gunnison River. 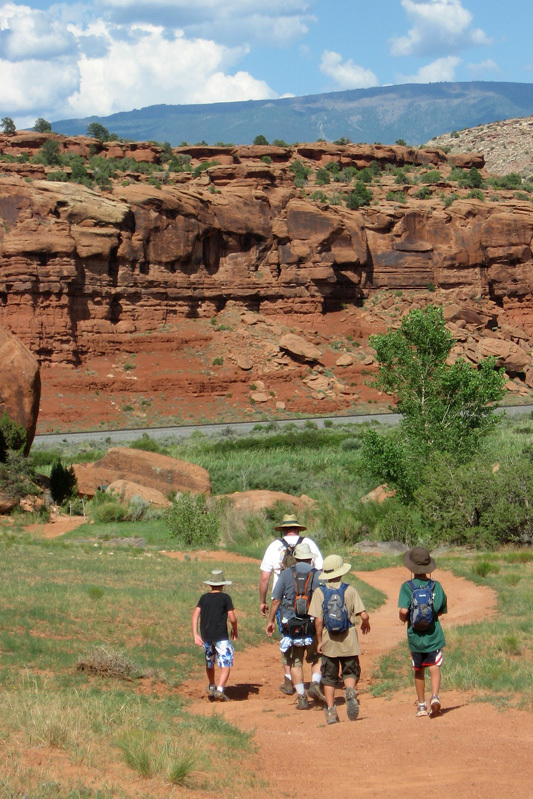 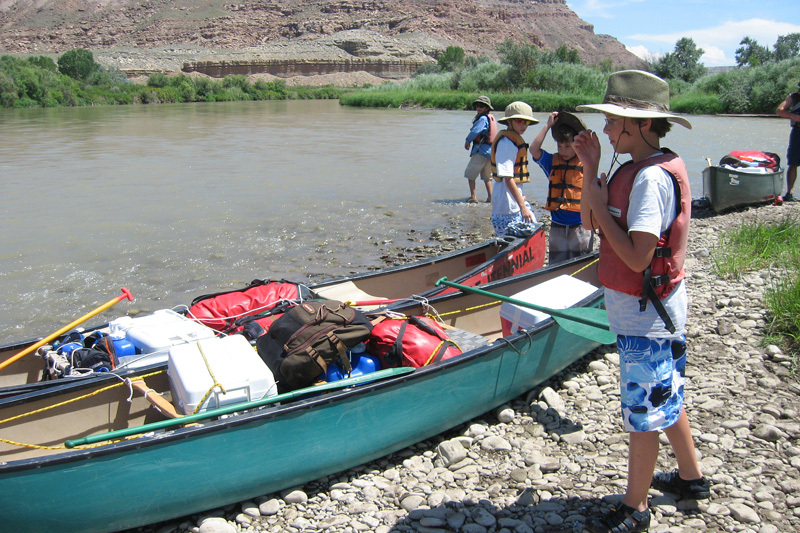 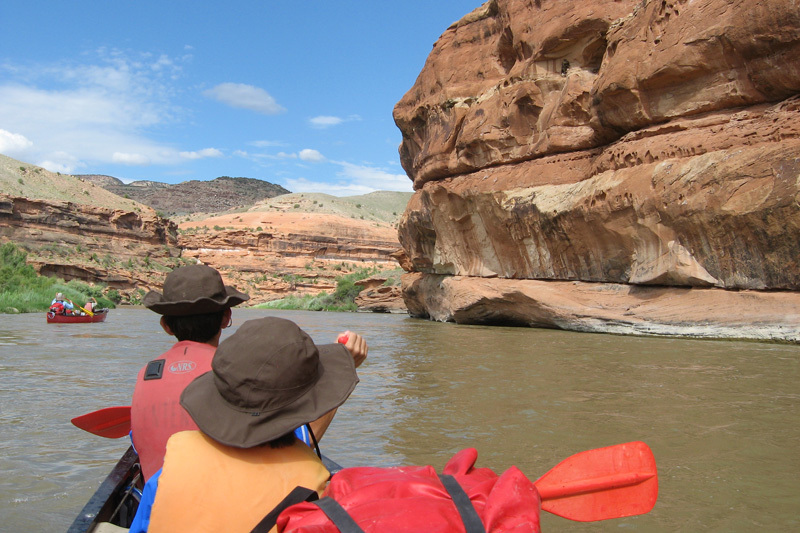 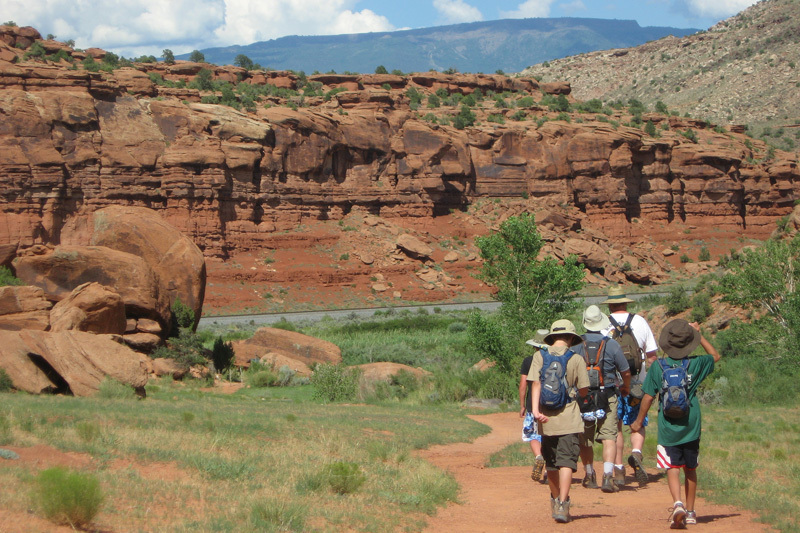 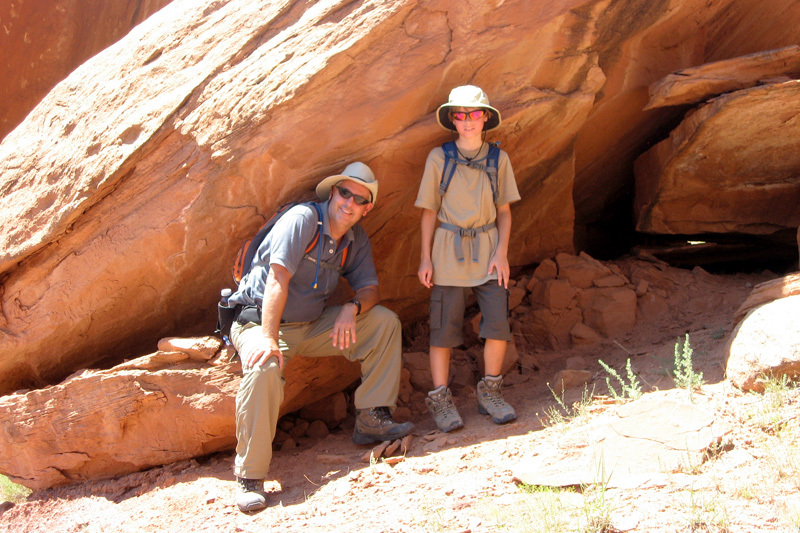 There we proceeded to pack our gear into dry bags and into the canoes for the start of our 15 mile journey through Escalante Canyon. 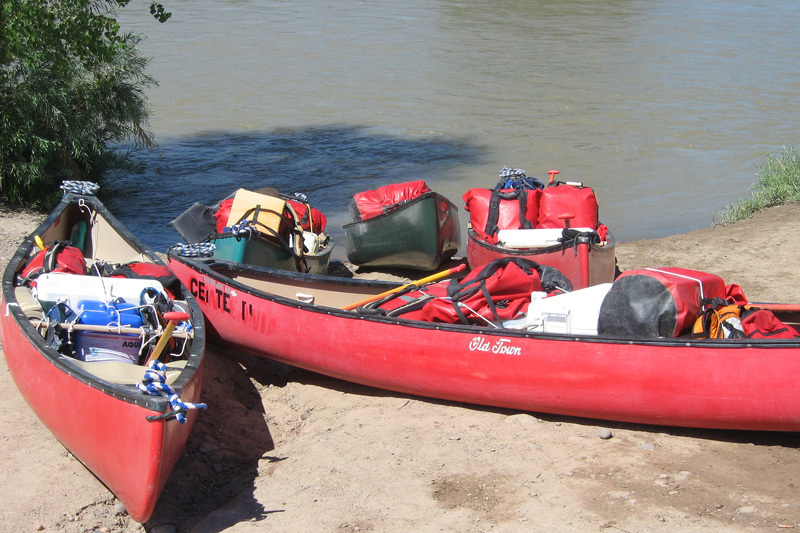 The pile in the foreground is the gear that I had to pack into one canoe while leaving leg room for the three of us. 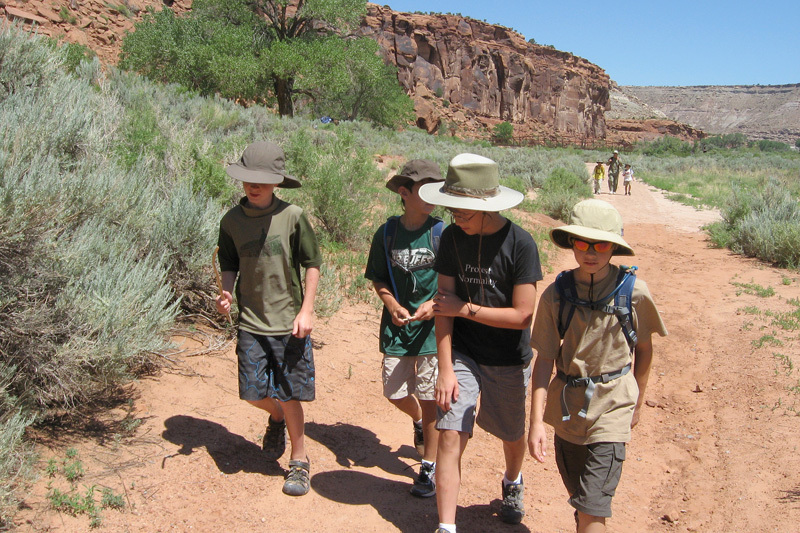 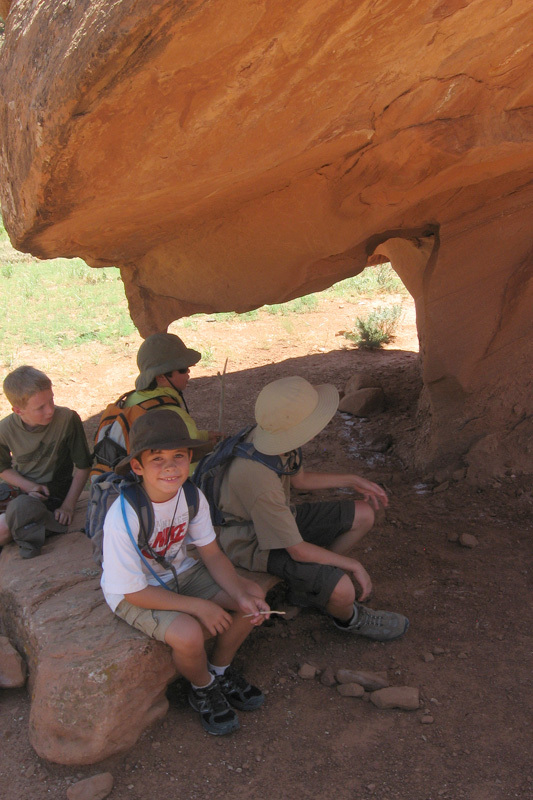 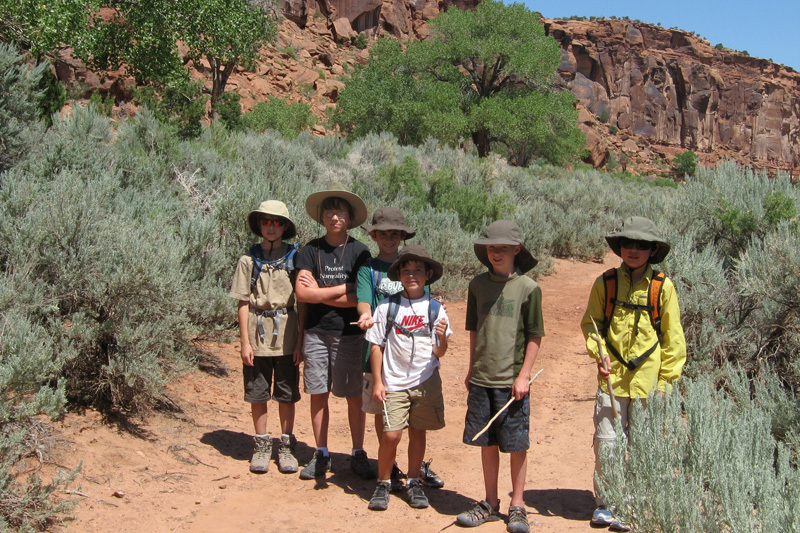 The kids - (from left to right) - Ethan S., Curtis, Allan, Brendan, Noah and Ethan G.
The picture below shows depicts us idyllically paddling through the canyon. 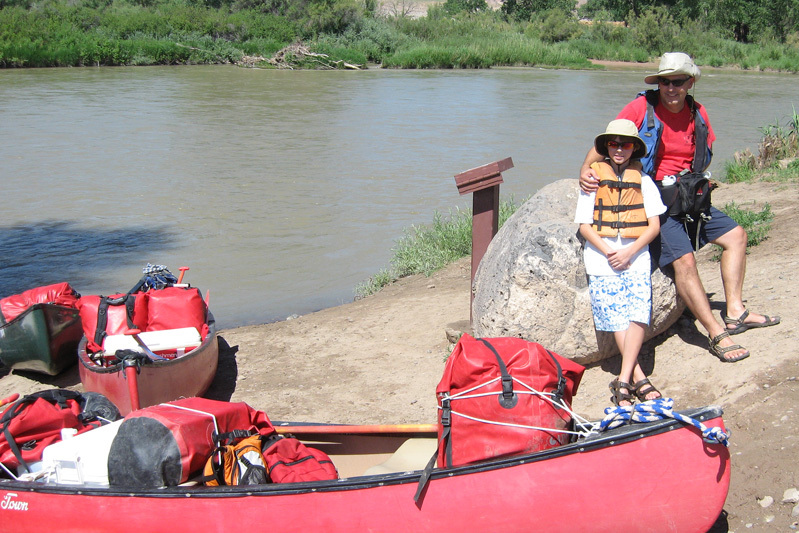 However right out of the gate, the Kendells ran into a problem when trying to avoid a rock at the take off they inadverntantly struck the shore of a small island with the front of their canoe. 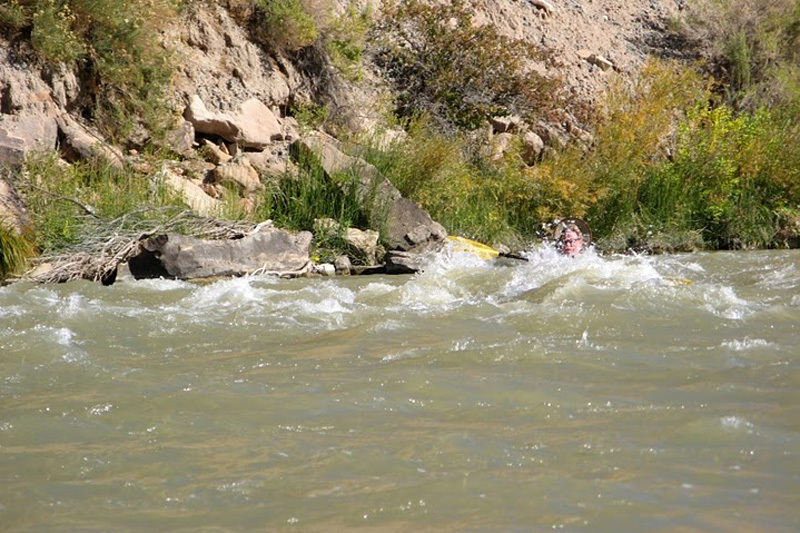 The island caught the front end and the back end got caught in a strong current which ultimately flipped the canoe. 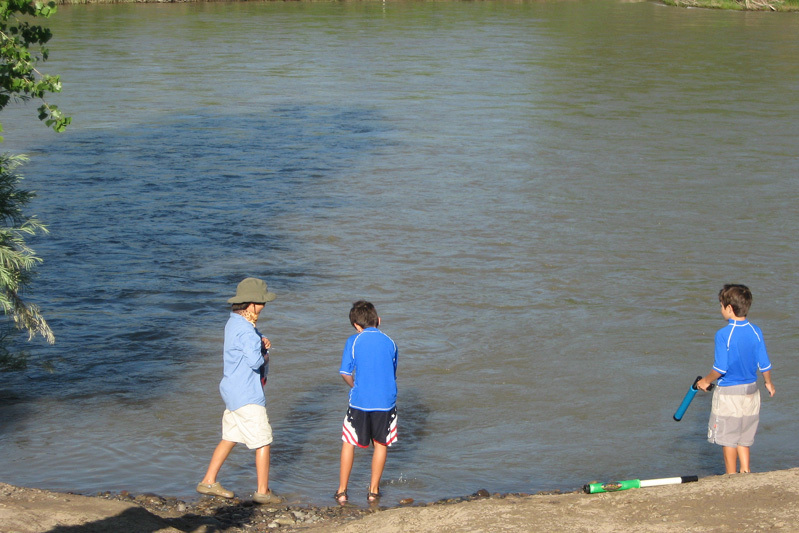 Luckily, they were able to get on the island and we all waited downstream while they bailed out their canoe. 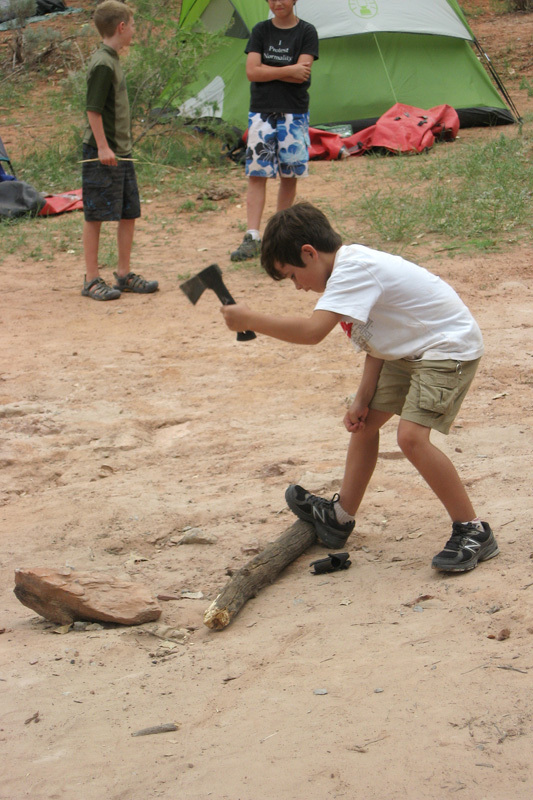 This was a wakeup call to us all that things could go wrong. 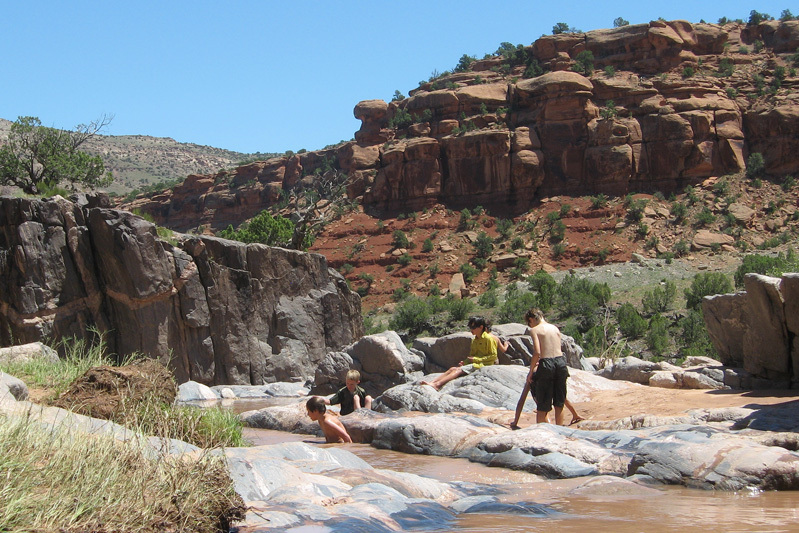 About 4 to 5 miles into the trip we came upon the Hail Mary rapids, a class 2 section of whitewater that would prove to be the most challenging part of the trip. 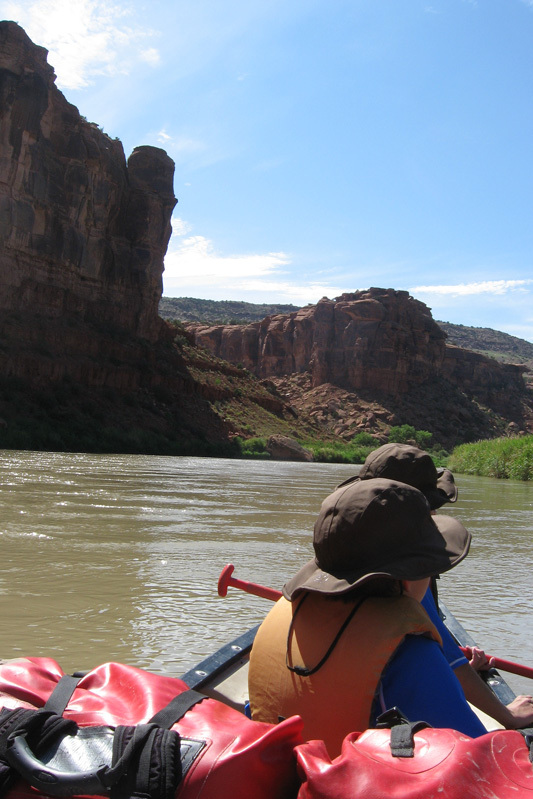 As previously mentioned, we had already flipped one canoe, so the sound of whitewater ahead put us on our guard. 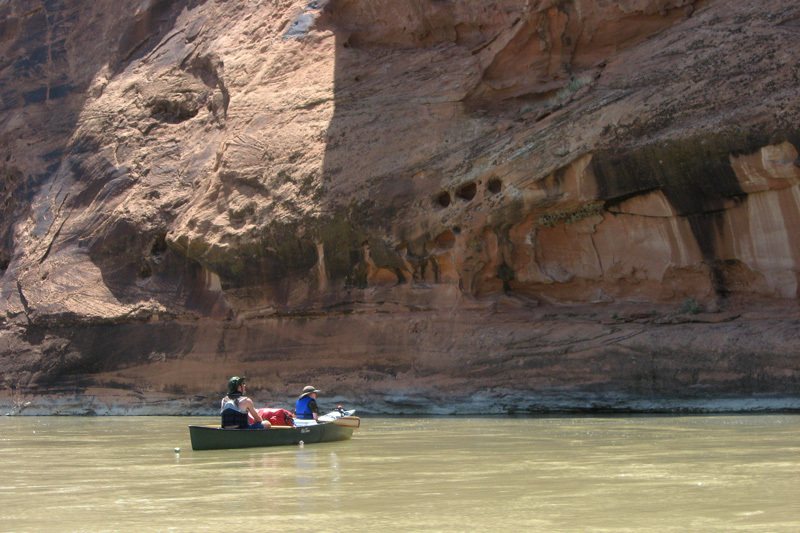 We were warned by the Centennial guides we had met earlier that there was one large "hole" which was to be avoided. 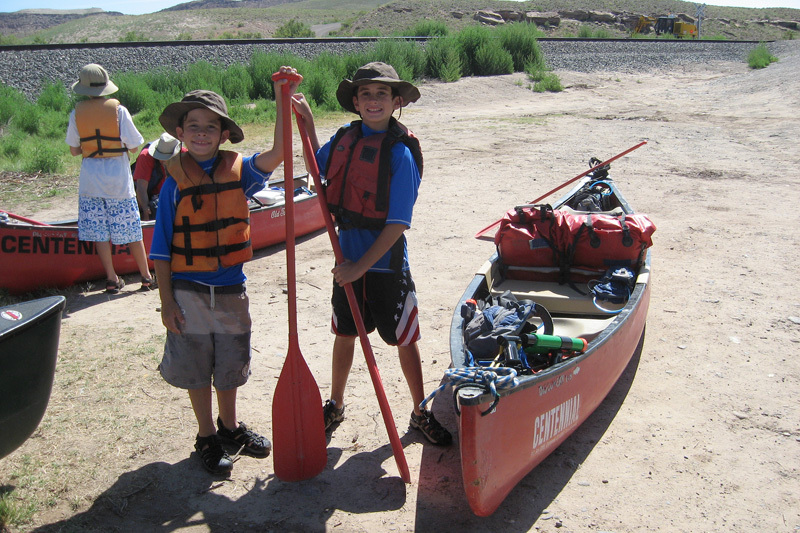 Two of the canoes decided to barge up for more stability. 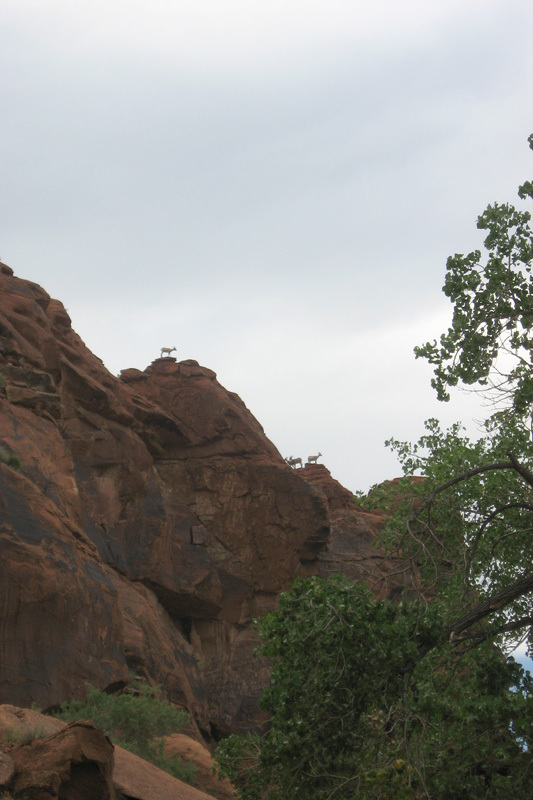 The other three forged ahead. 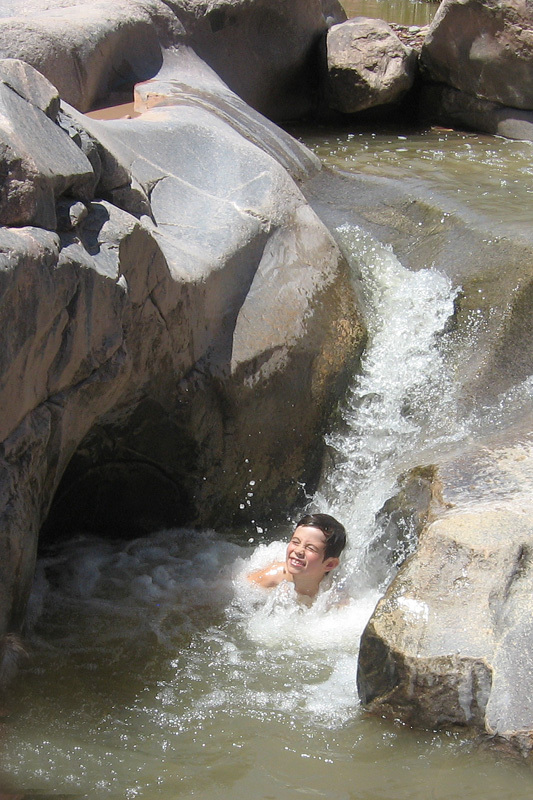 Unfortunately, I mis-understood where exactly the hole was and after riding some wave trains hit it head on. 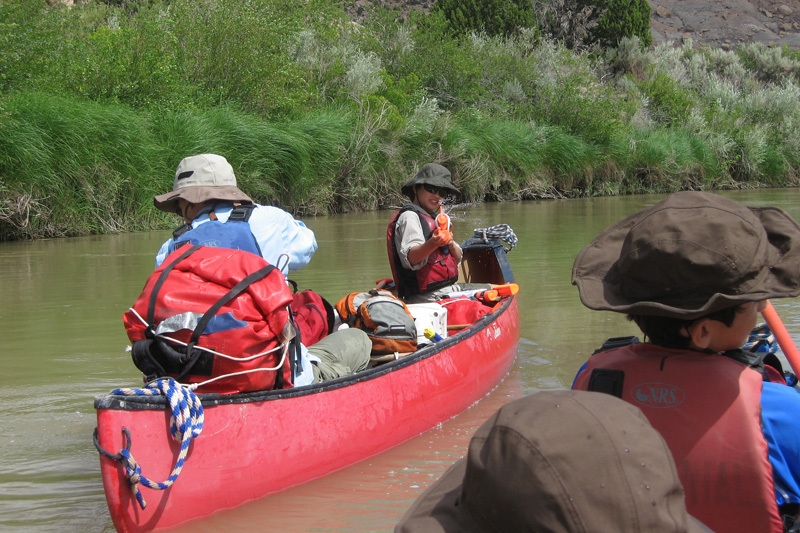 Upon hitting the hole, the front of the canoe dived in and was immediately swamped and I was involuntarily egressed (as Bob later put it) from the canoe. 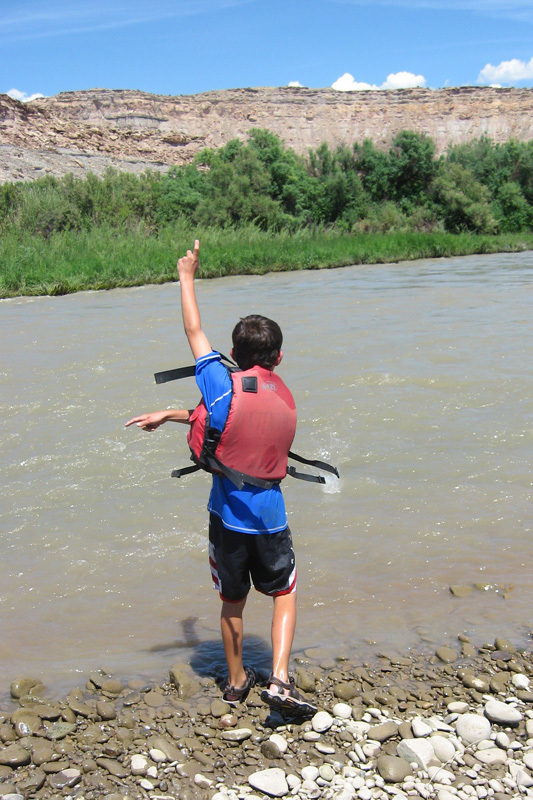 I held on to the side to prevent it from flipping and was subsequently escorted for the next 1/2 mile or so of river while catching whatever was not tied down and throwing it back in. 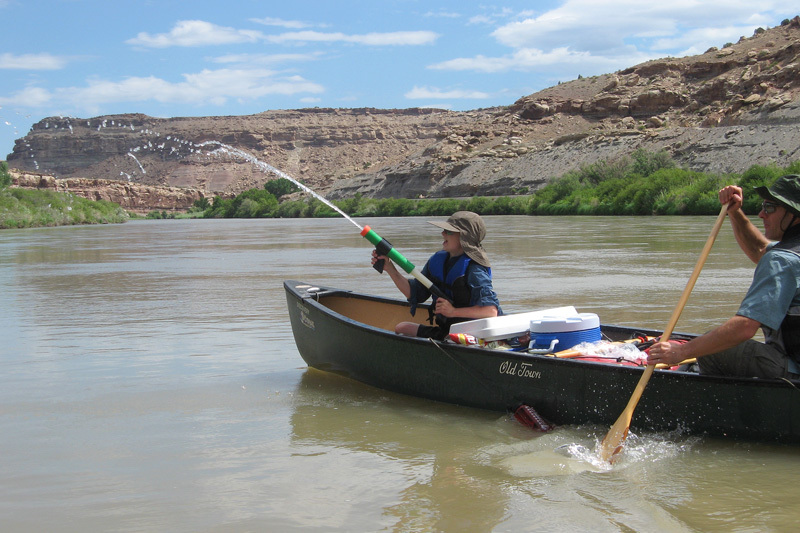 Humorously, I was attempting to bail out the canoe while being dragged along side it. 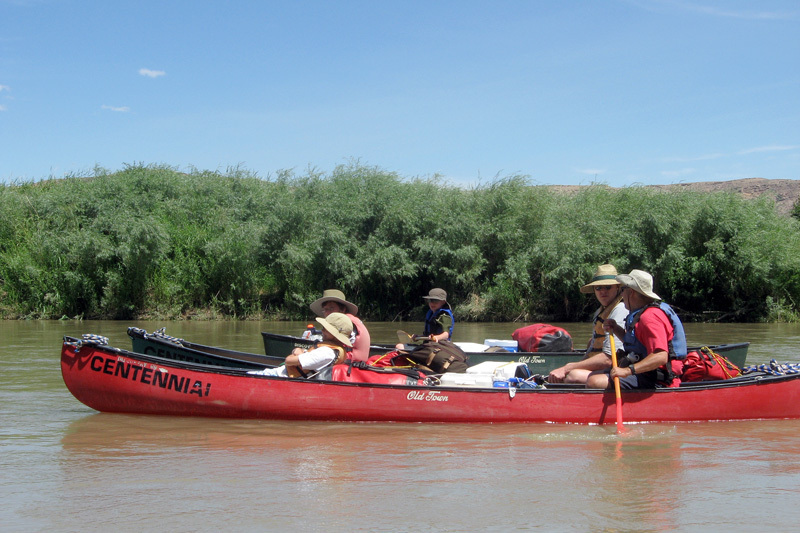 I quickly learned that a canoe loaded with gear (fortunately tied down) and water might as well have been a freight train and there was no stopping it until we reached calm water. 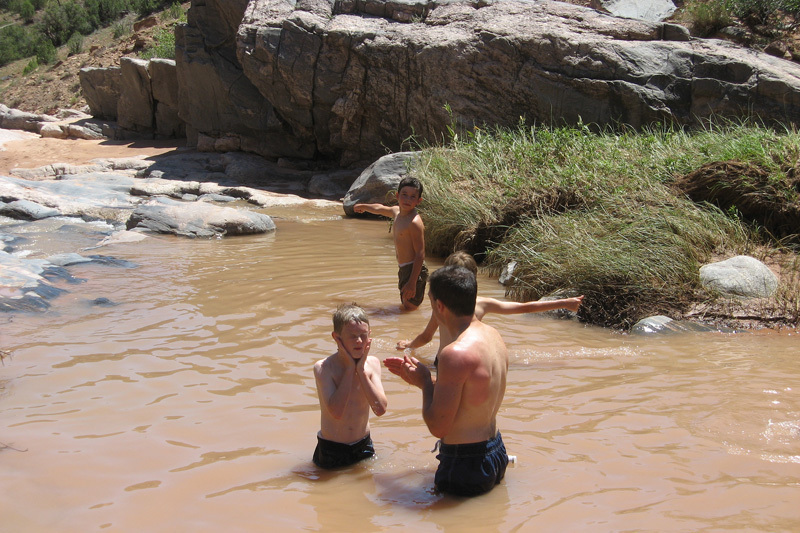 Then it was my turn to spend 20 minutes bailing out the water. 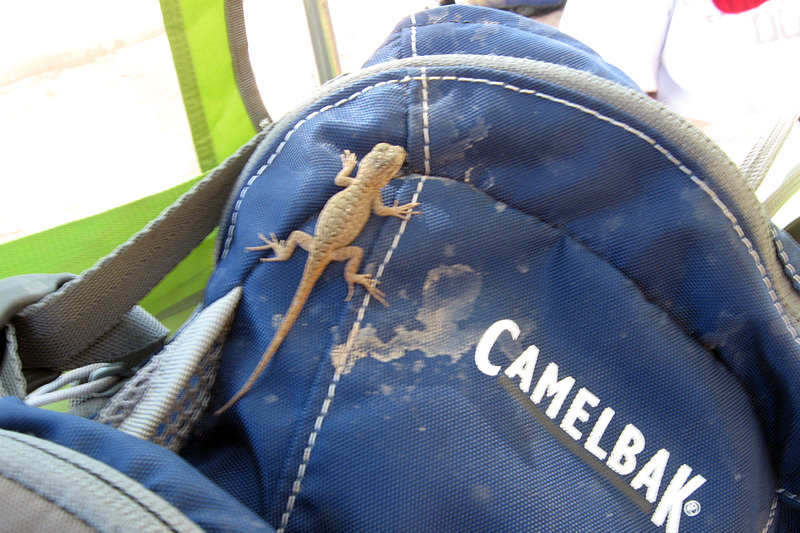 Luckily we lost no gear (some items got wet, but would later be quickly dried out in the Colorado sun), though the soles of my shoes blew out forcing me to duct tape them up. 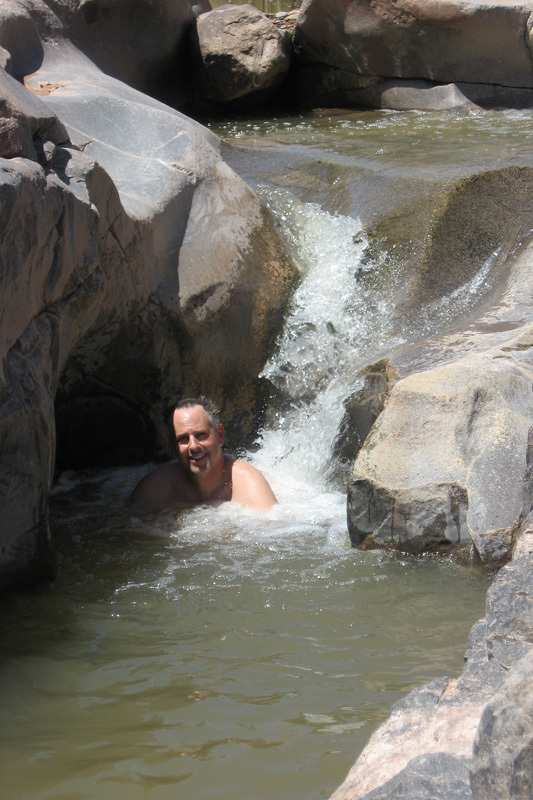 The picture below is of the Hail Mary rapids, but it is of someone else on another trip - looks like he found the hole as well. 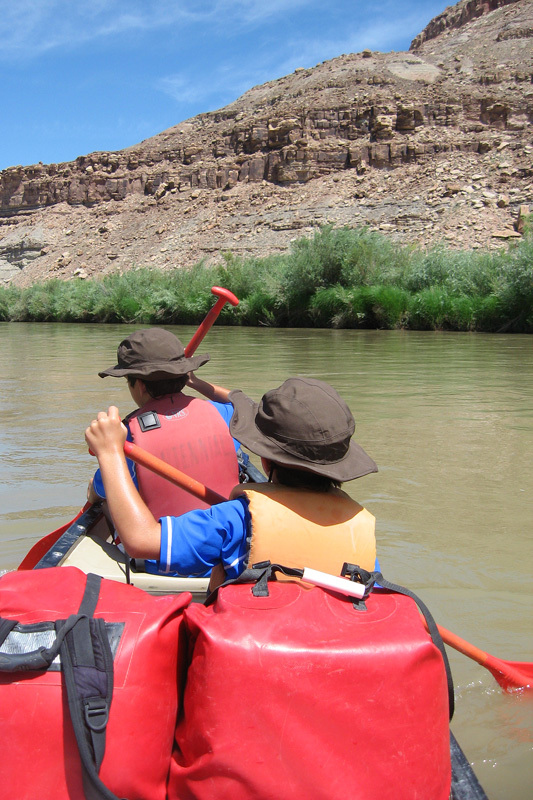 Early in the afternoon we came upon another island with a suitable beach where we pulled in for lunch. 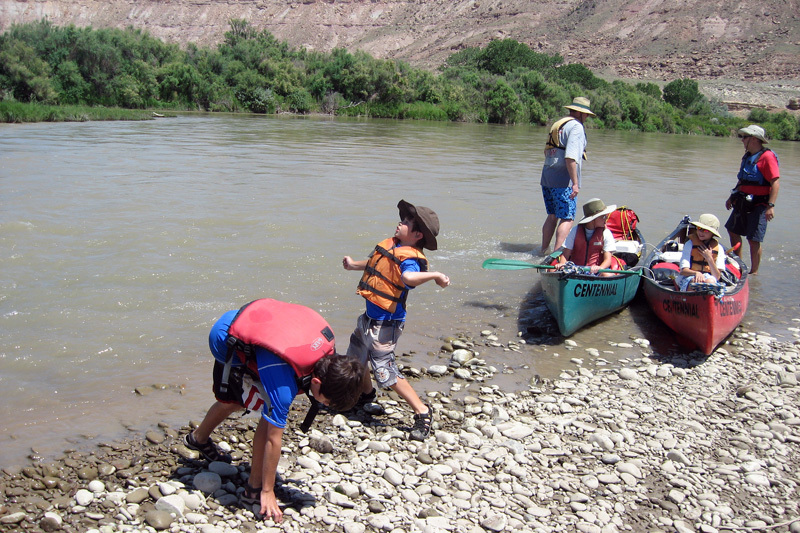 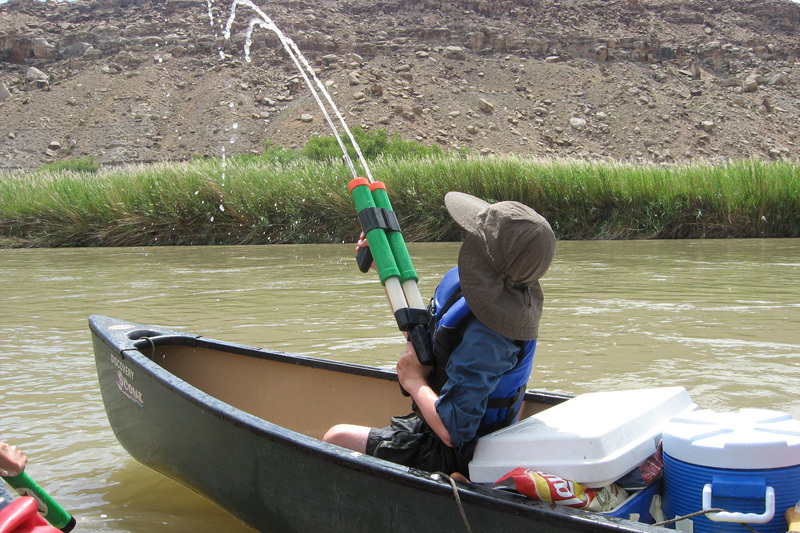 The kids enjoyed throwing and skipping stones and also helped to collect firewood which seemed plentiful on the small island which we henceforth referred to as "firewood island"
After lunch we departed along the most scenic part of Esclante Canyon engaging in numerous water cannon fights along the way. 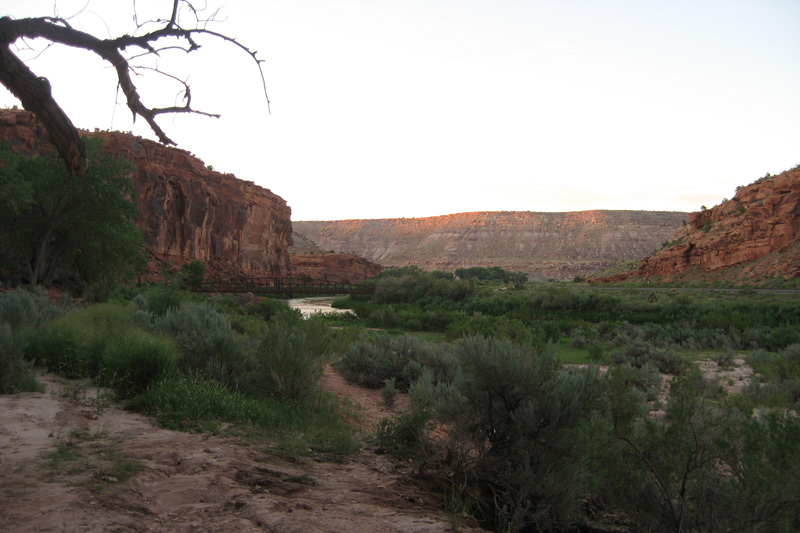 We finally arrived at the mouth of Dominguez Canyon in the late afternoon. 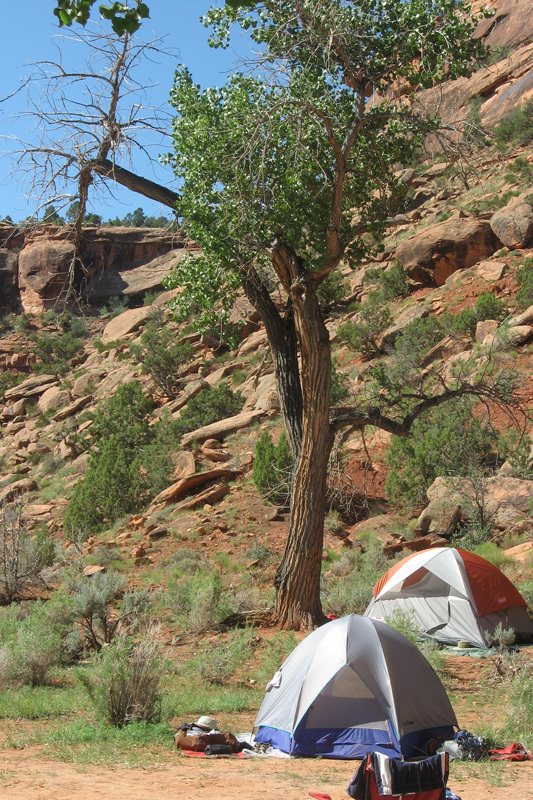 We selected a nice camp ground underneath a large cottonwood tree that would prove to be invaluable due its prodigious shade making abilities. 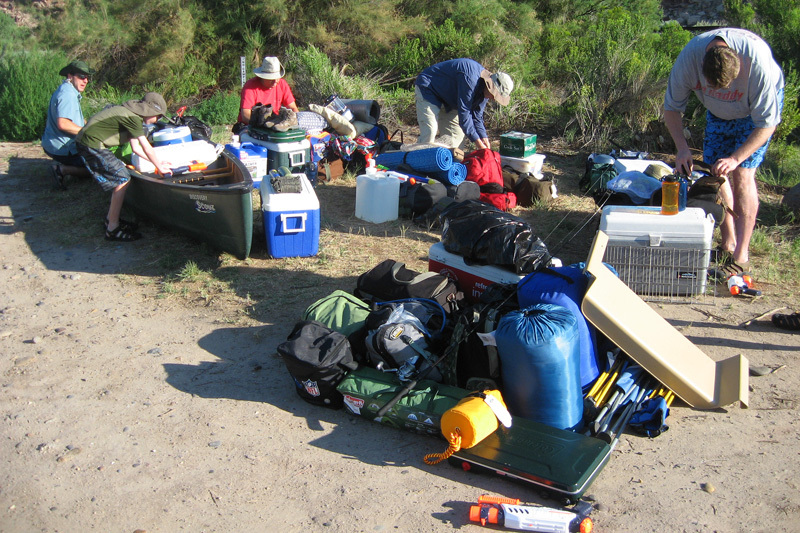 Unfortunately, the camp was about a 200 yard slightly uphill hike from the shore where we parked the canoes and we had to make several trips to move all our gear up to camp. 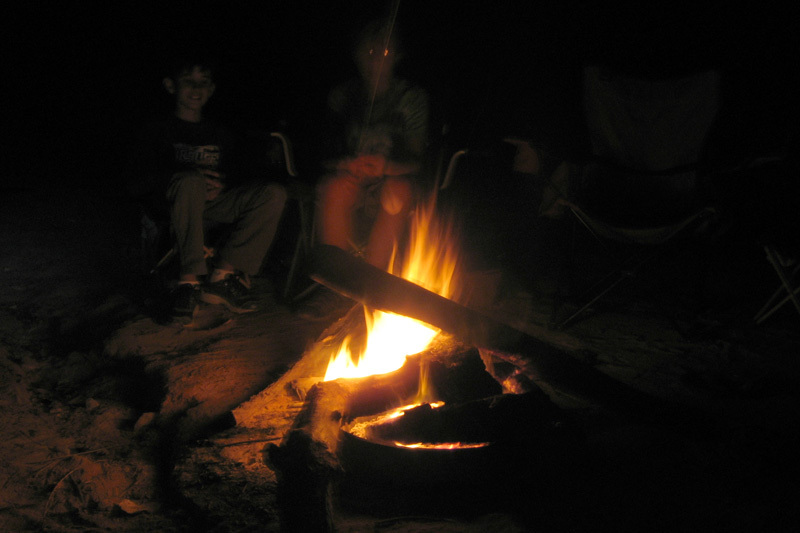 The mosquitoes came out in force to greet us and it was quite a battle to get camp set up amidst the heat and the onslaught of mosquitoes. 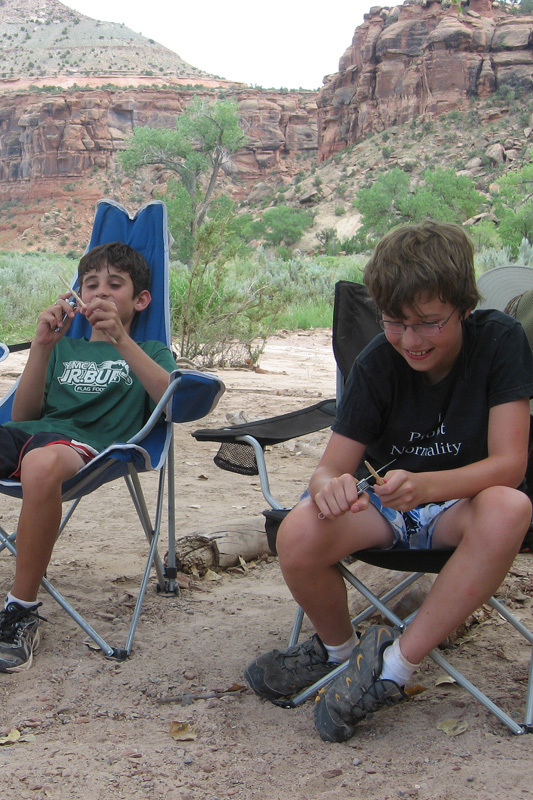 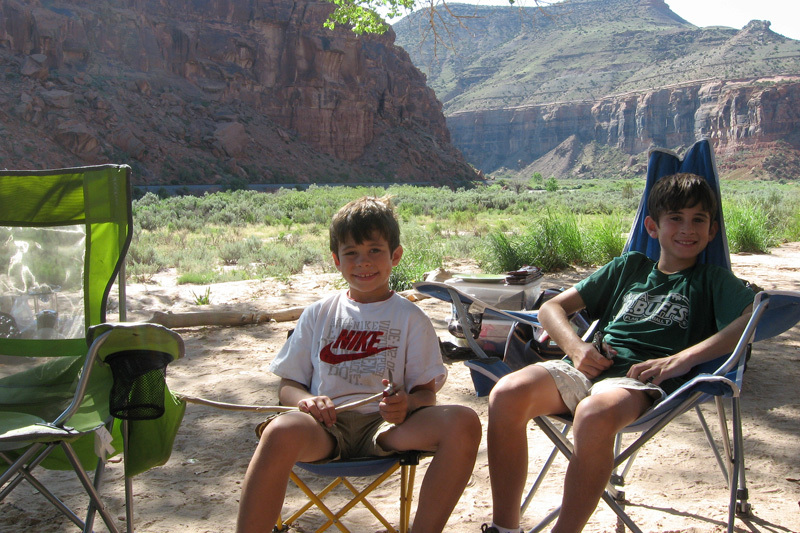 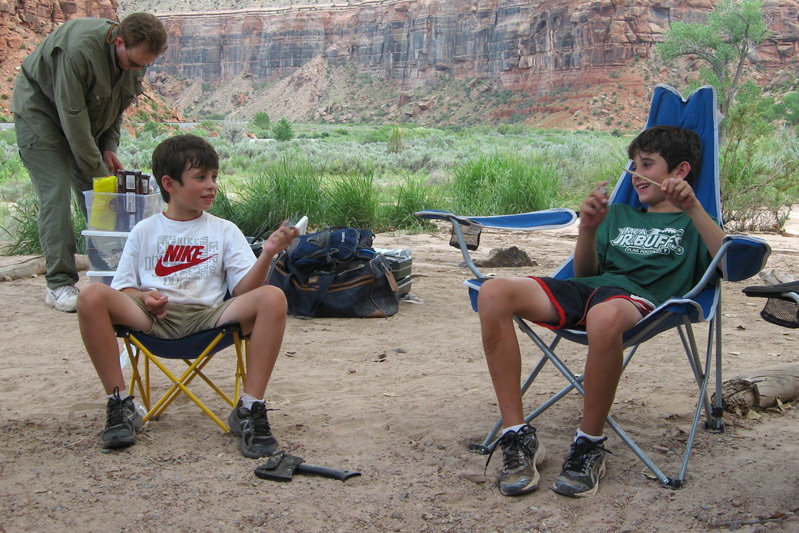 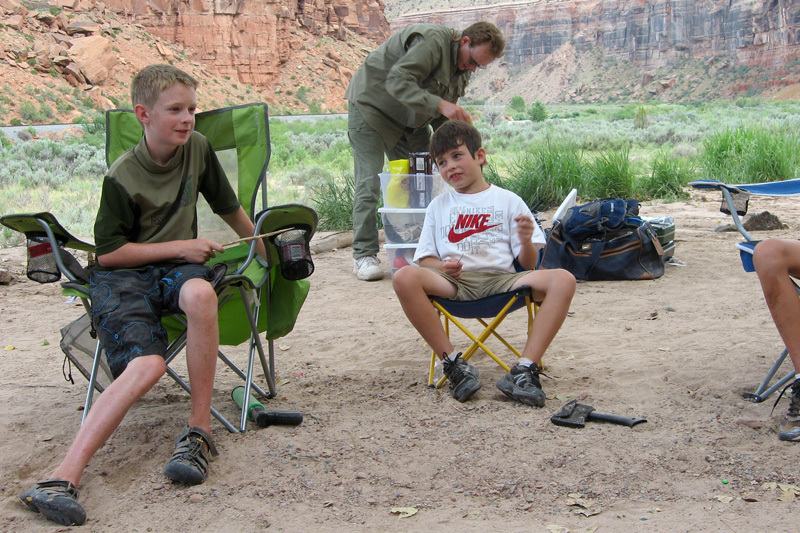 But we eventually prevailed and enjoyed our first meal by the campfire. 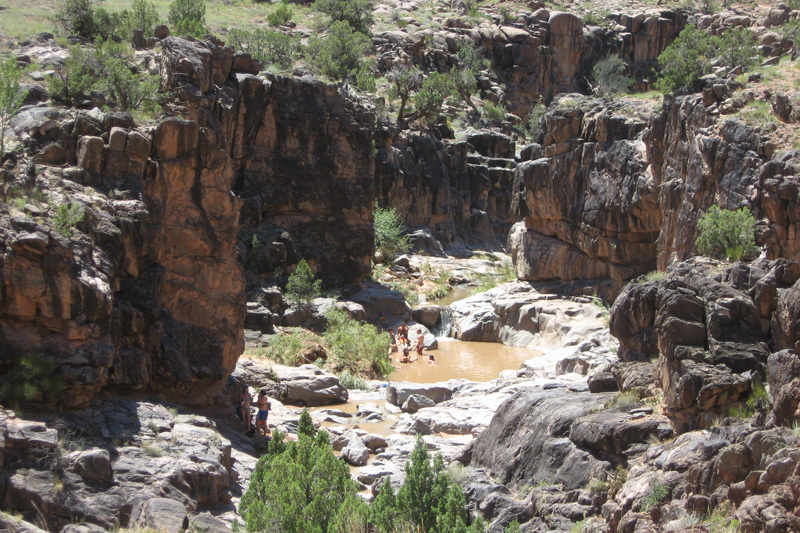 Day 2 - We all slept in on day 2 and after breakfast and some dish washing duty we set of on foot to explore Dominguez Canyon. 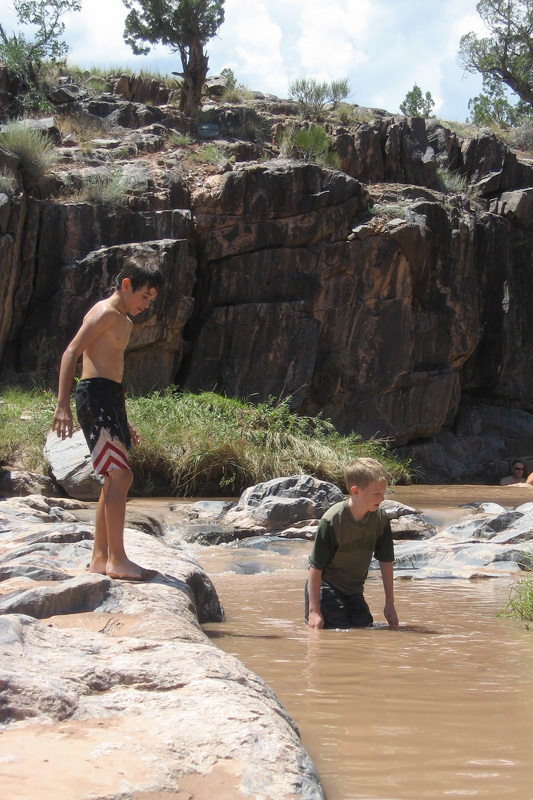 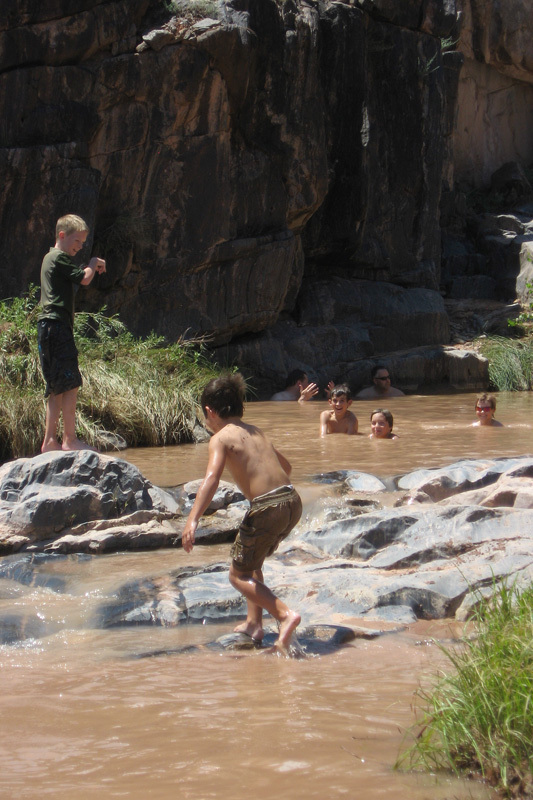 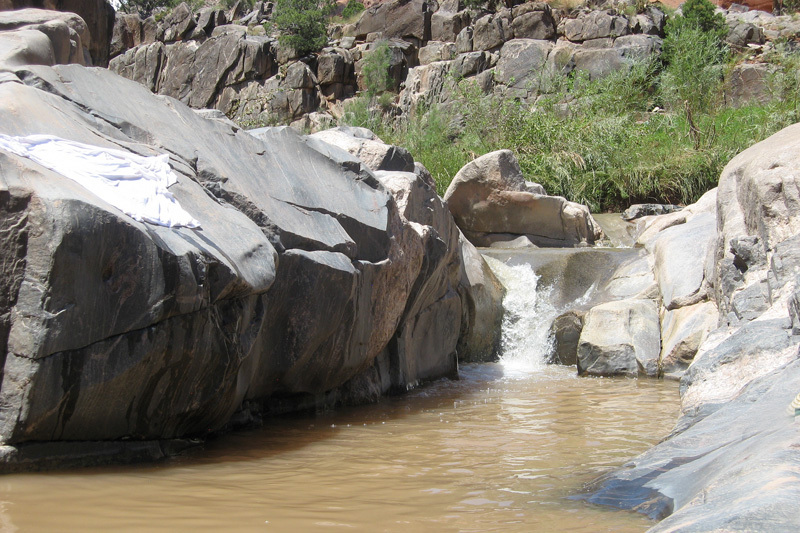 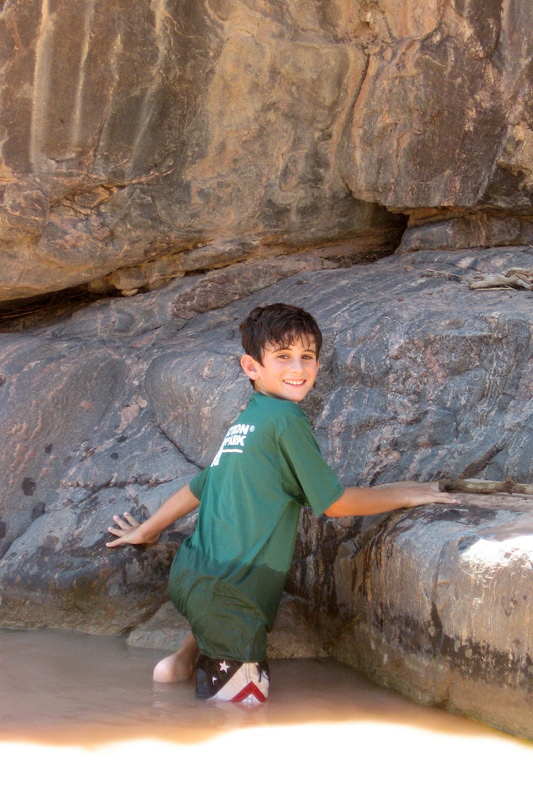 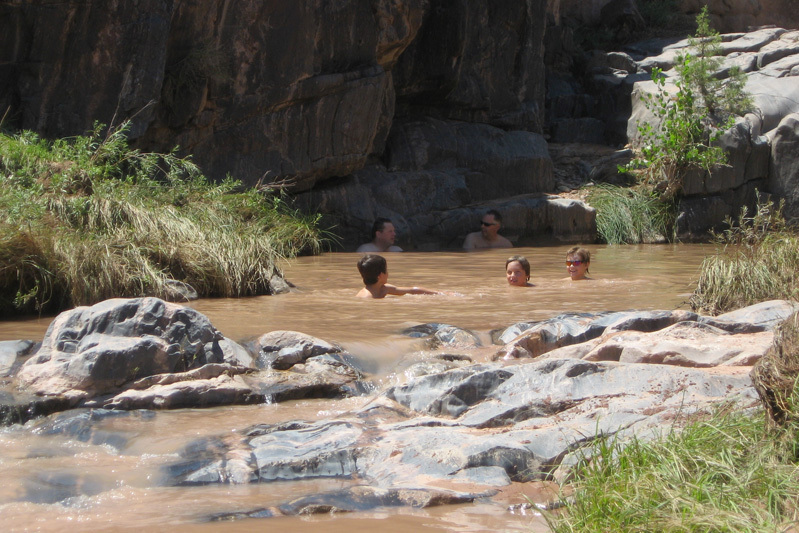 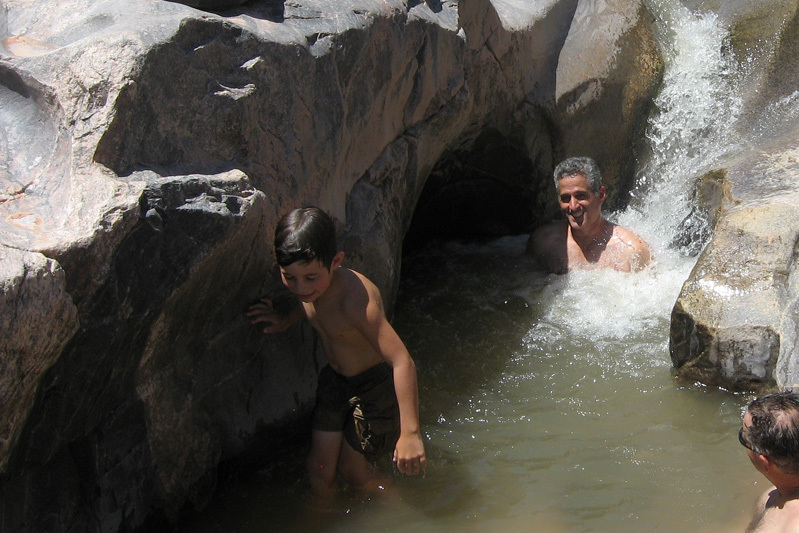 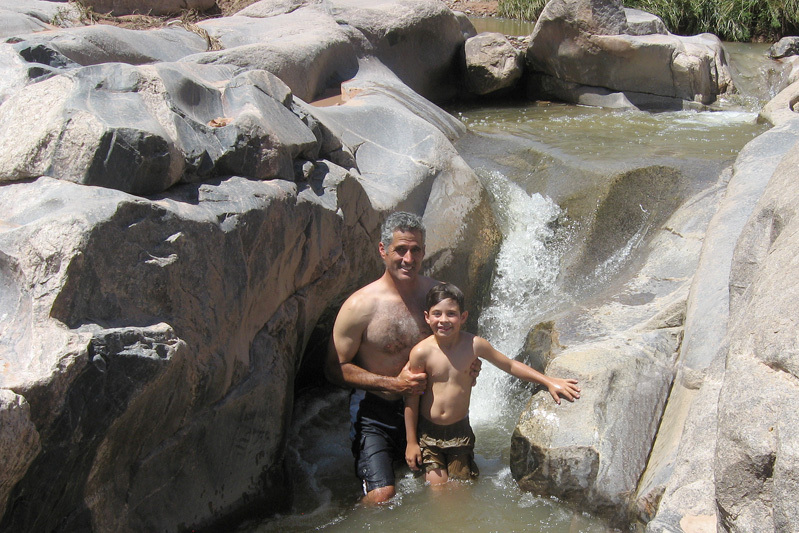 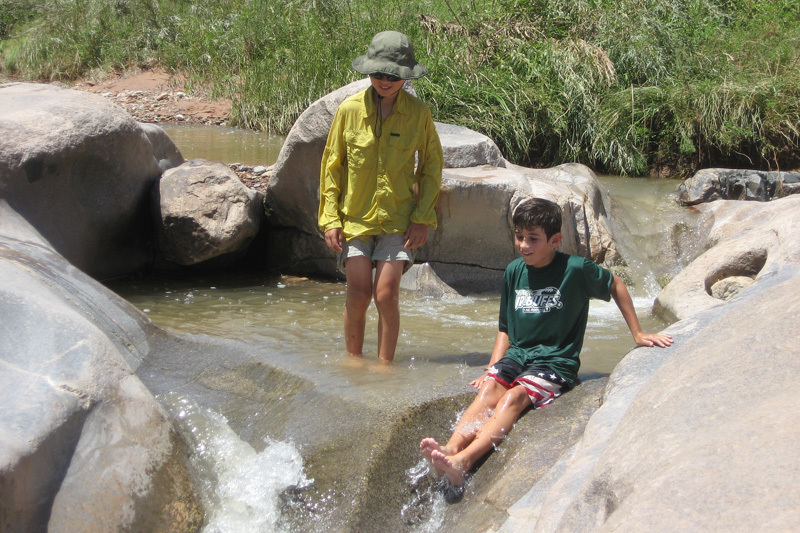 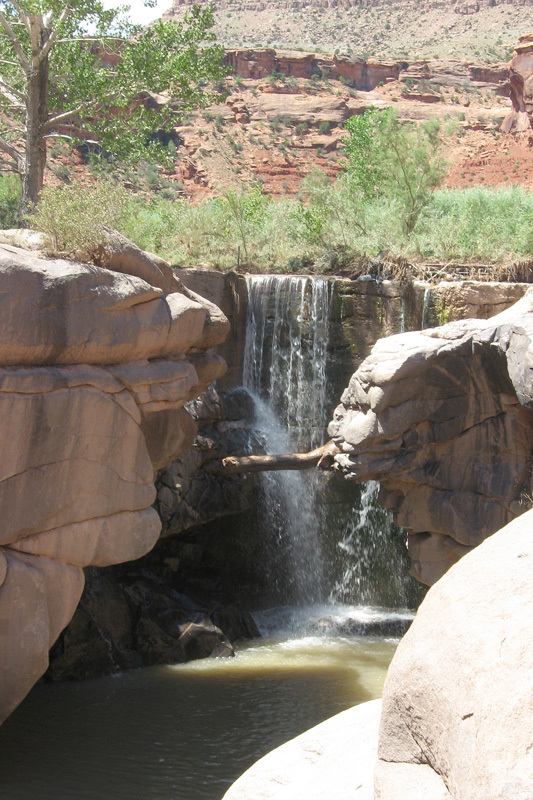 The Canyon featured numerous falls and swimming holes created by Dominguez Creek. 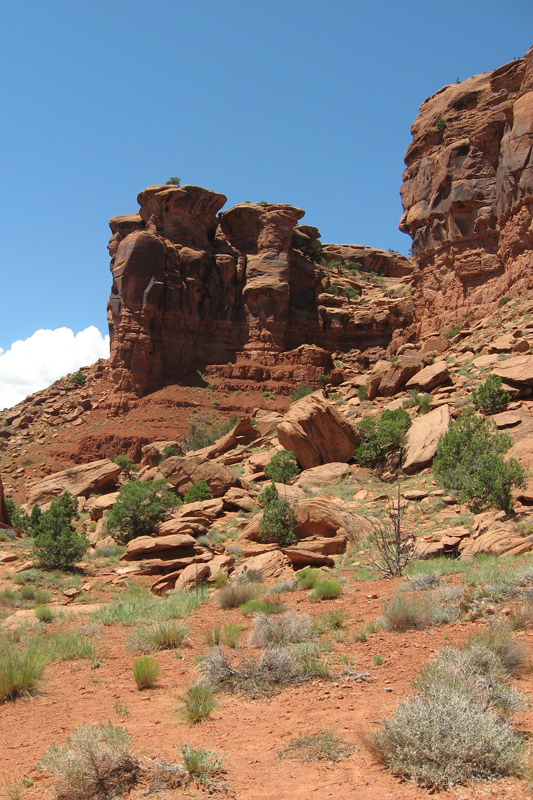 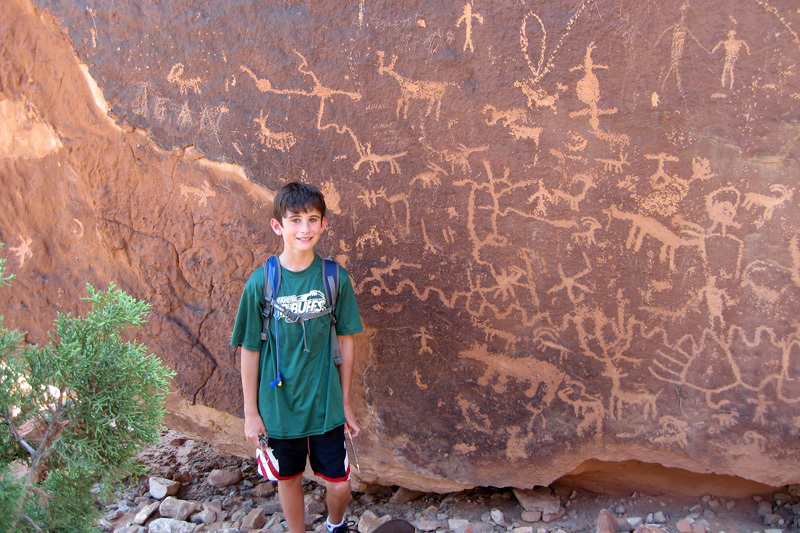 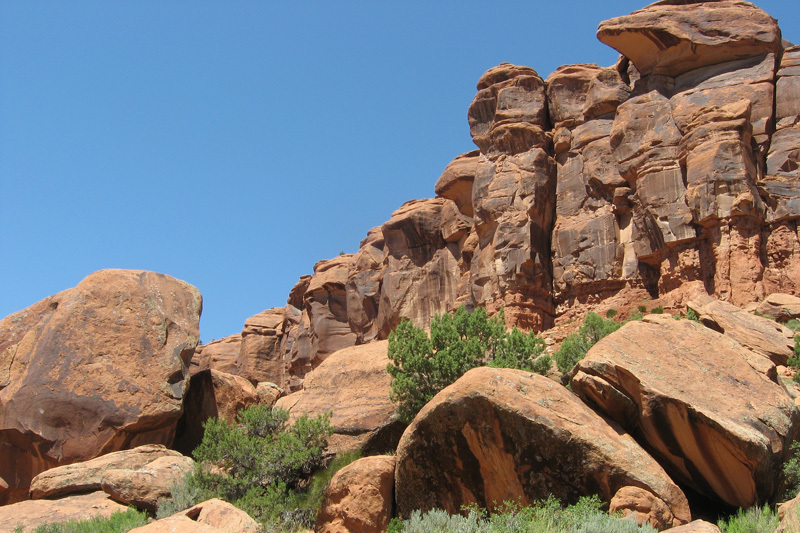 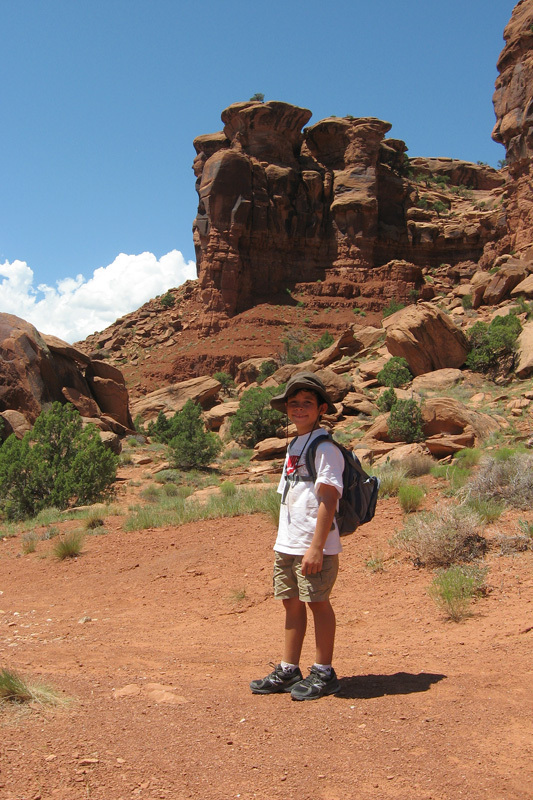 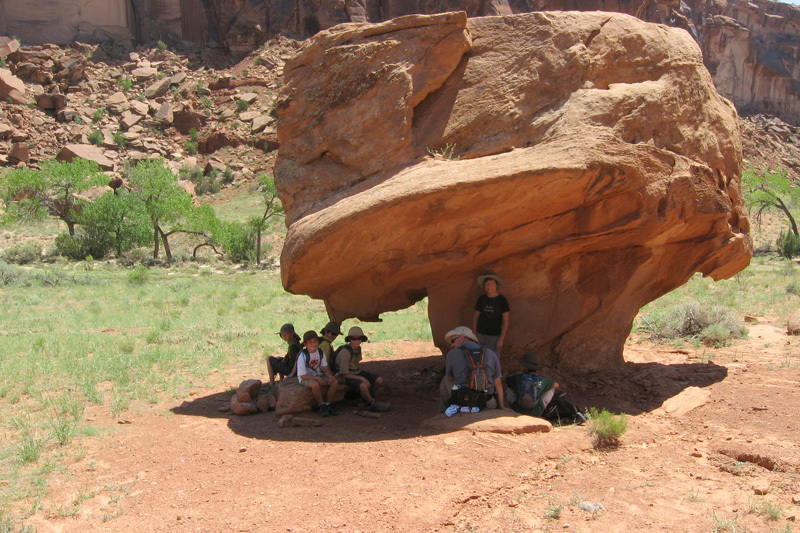 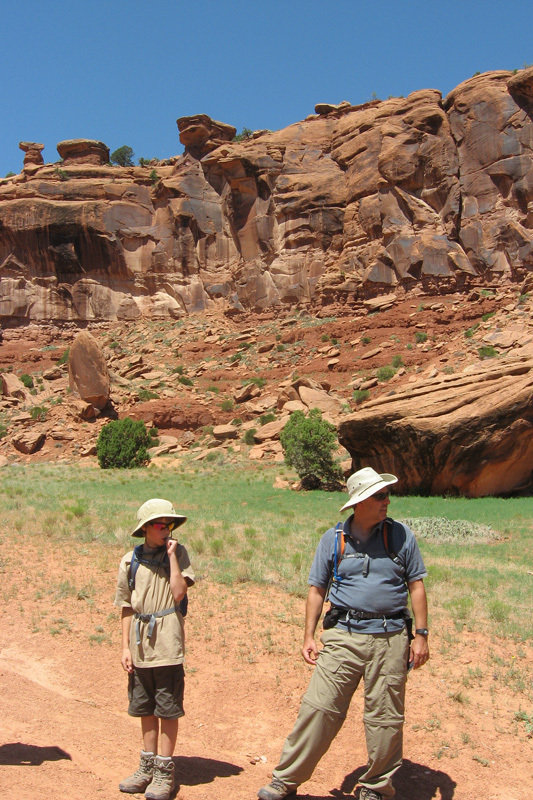 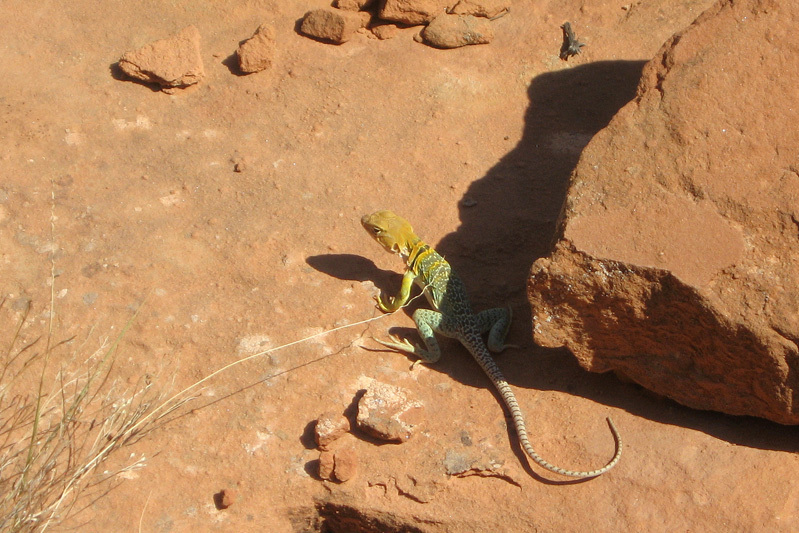 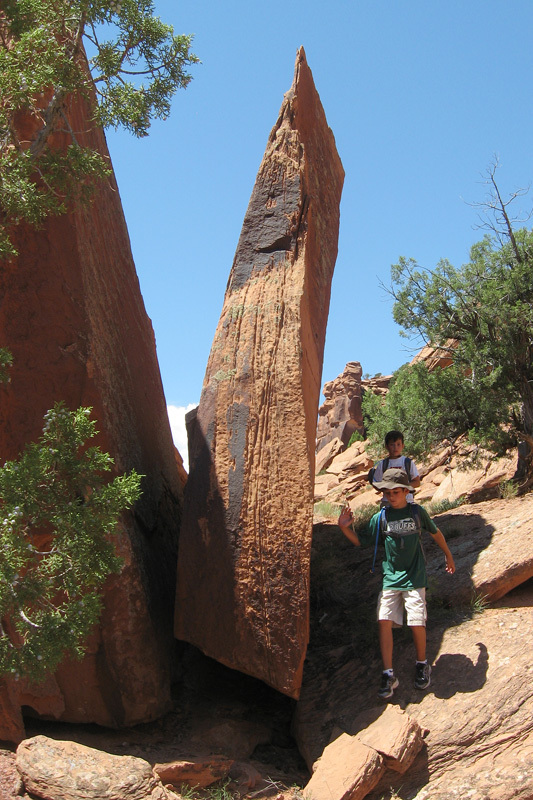 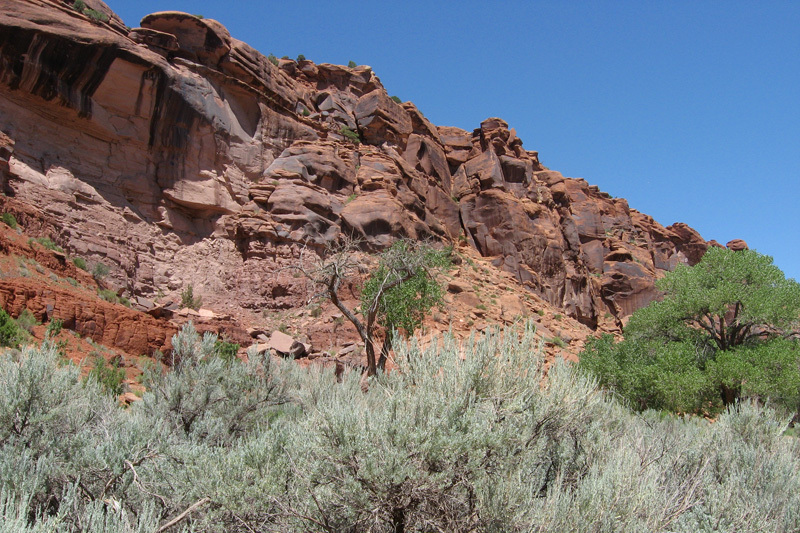 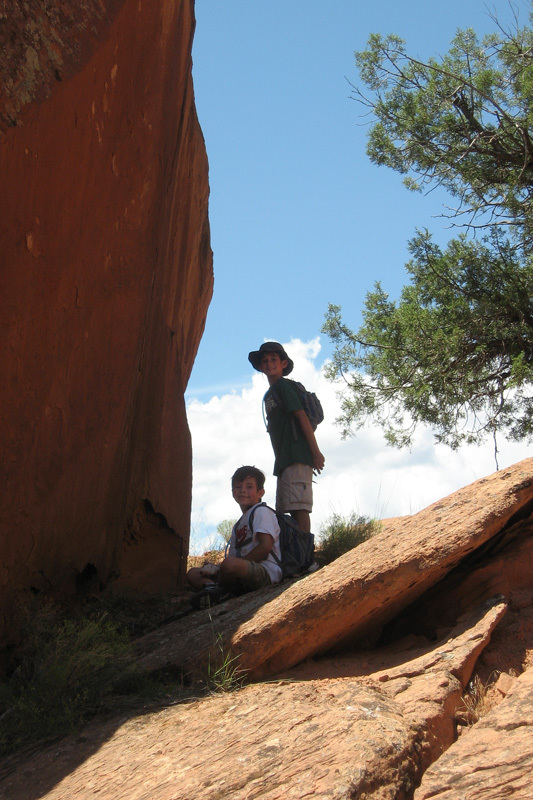 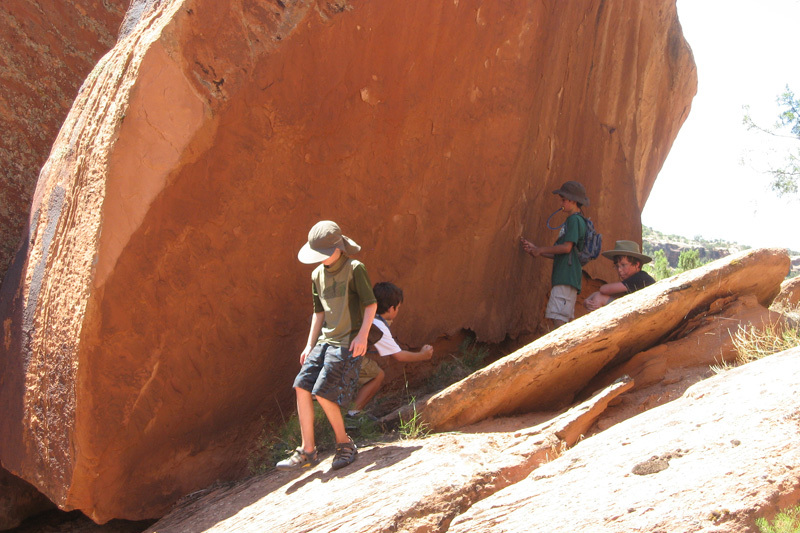 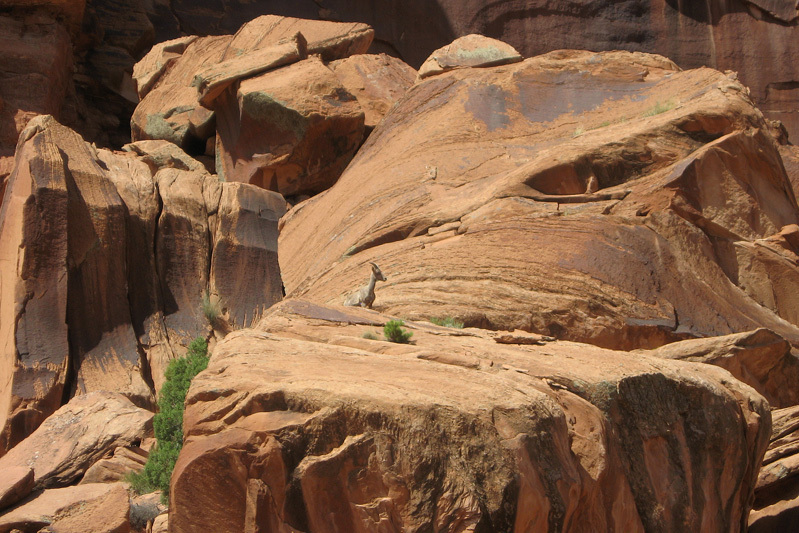 There were also a number of interesting rock formations, the remains of homesteads, wildlife and Ute Indian petroglyphs. 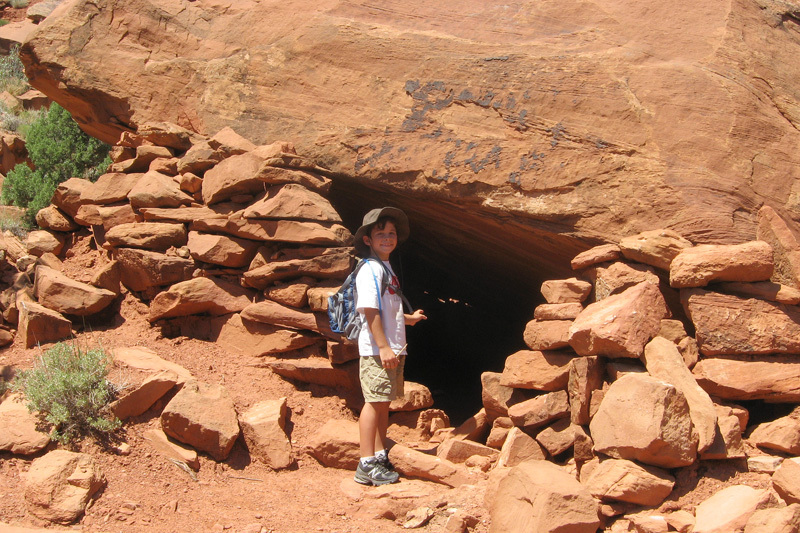 Wooley's shelter - a temporary shelter build by a homesteader while he built his cabin. 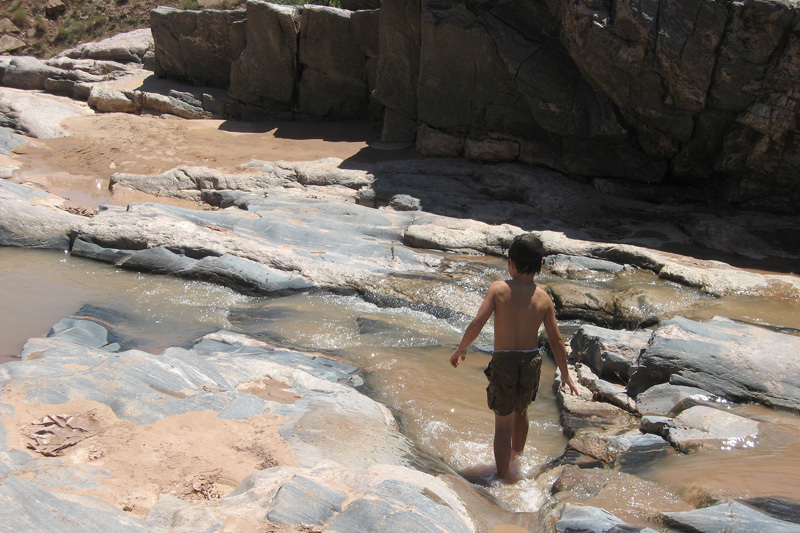 We stopped at the third swimming hole that we encountered and spent most of the afternoon in its cool waters. 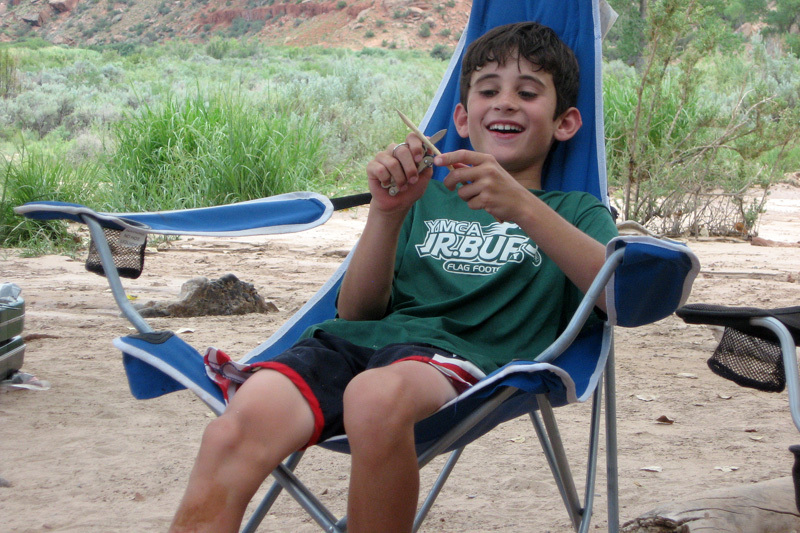 Back at the campsite for some relaxation, firewood chopping and fishing. 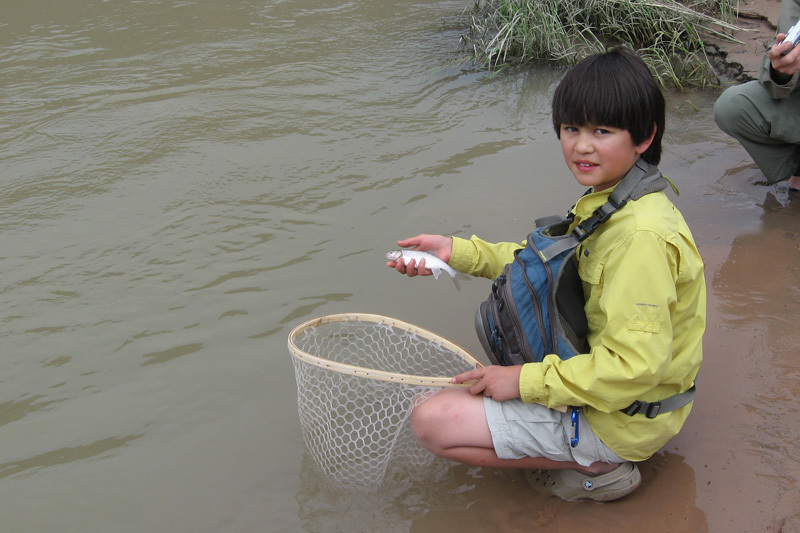 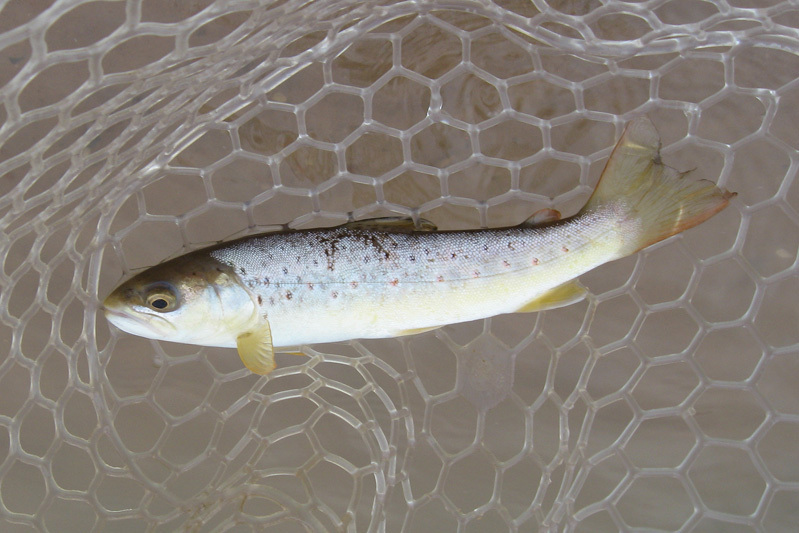 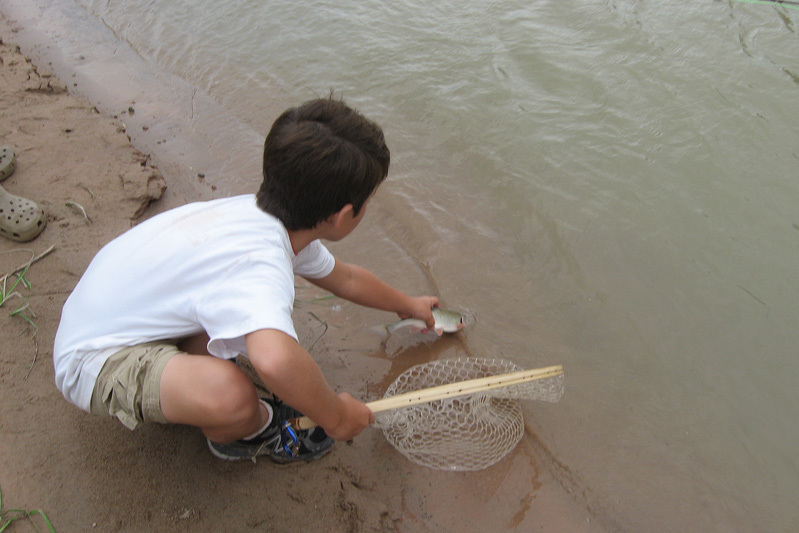 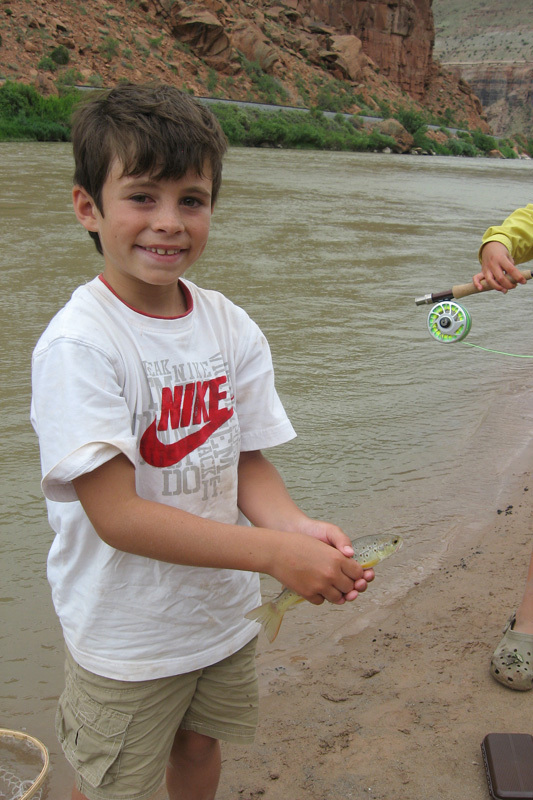 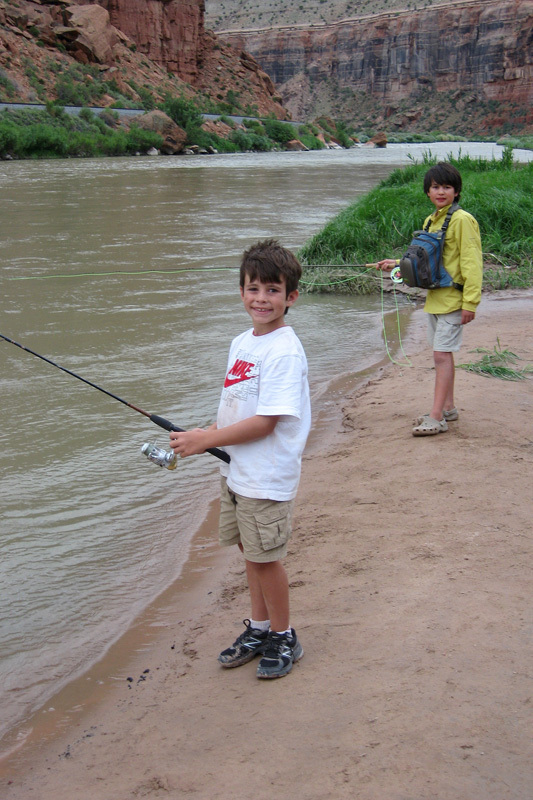 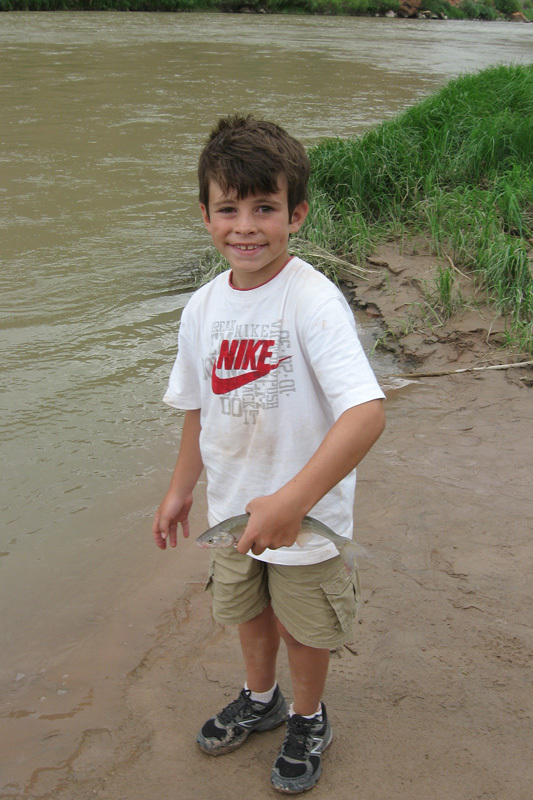 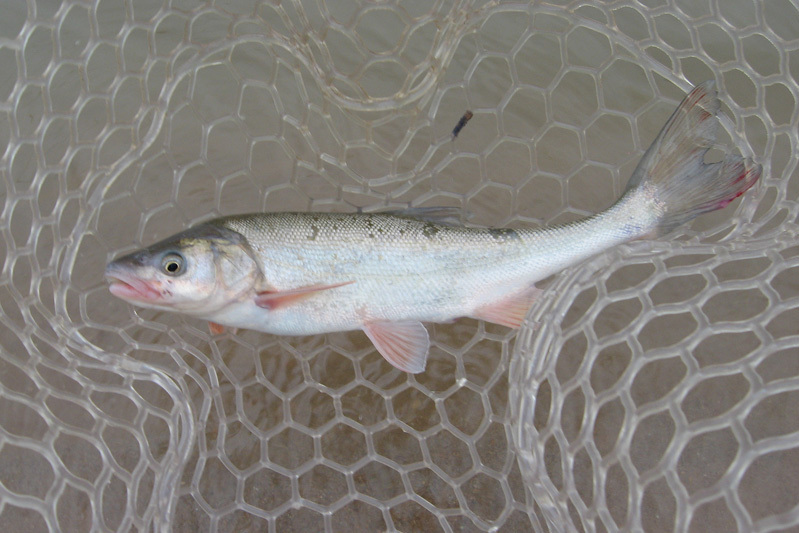 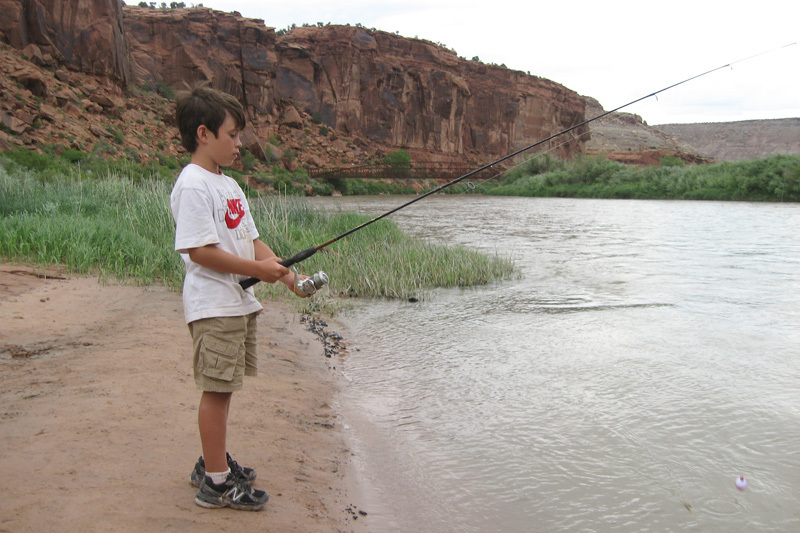 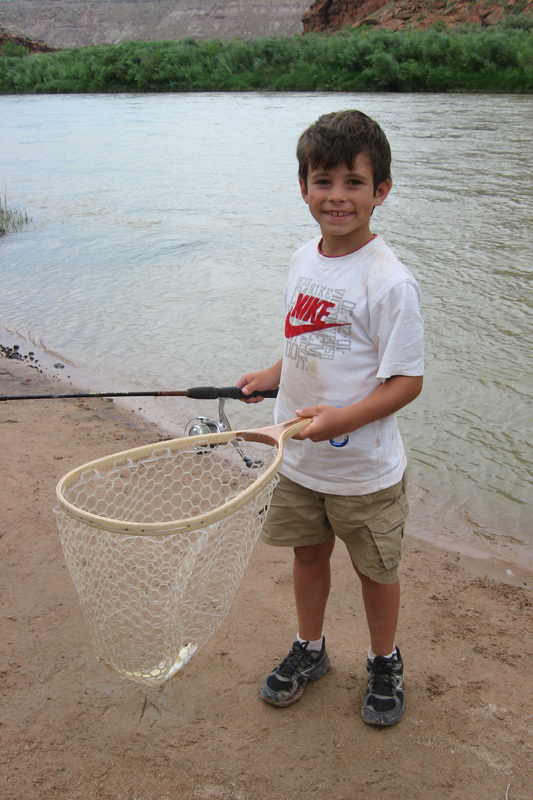 Brendan really enjoys fishing and was able to catch two nice fish along the river - a Brown Trout and a Colorado Pike Minnow. 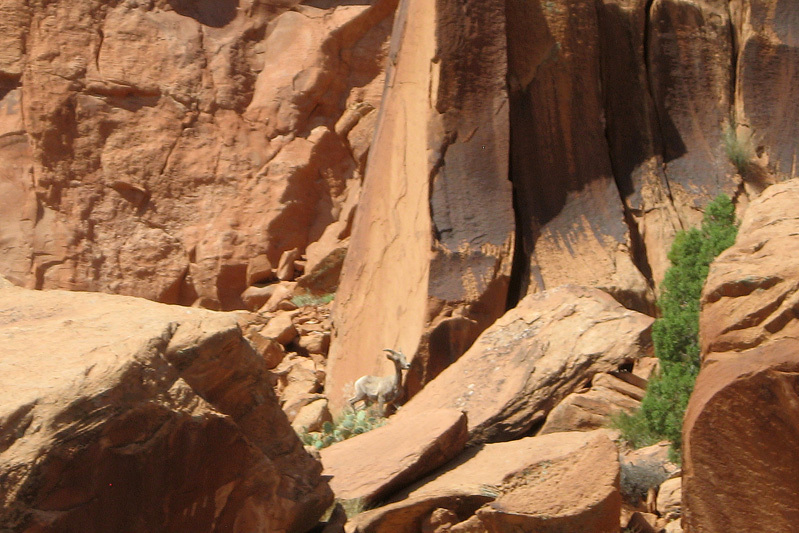 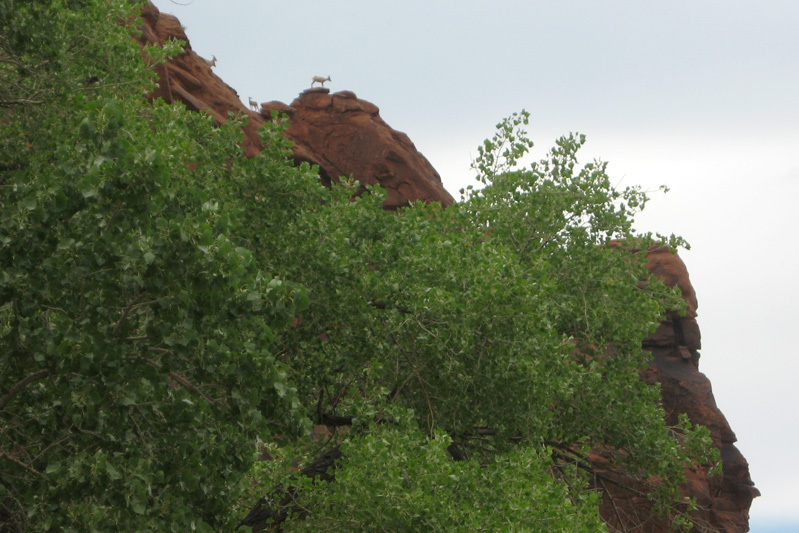 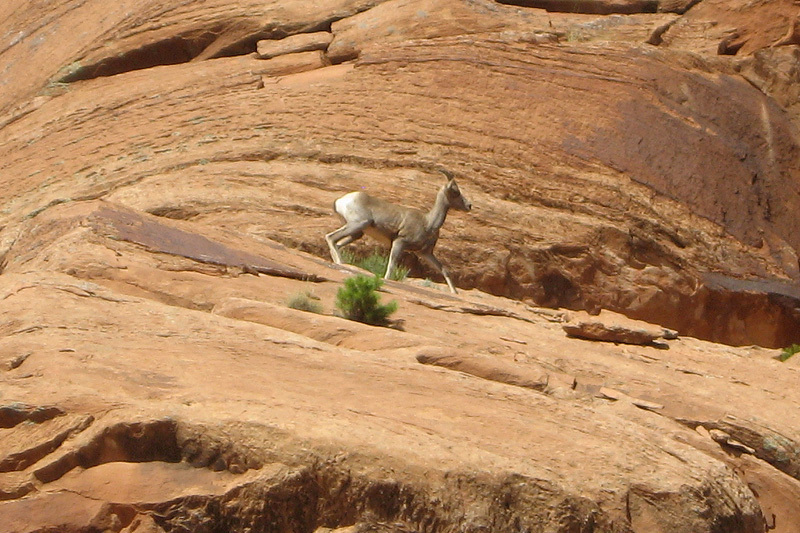 We also spotted some mountain goats perched high on the canyon wall apparently scouting out the scenery. 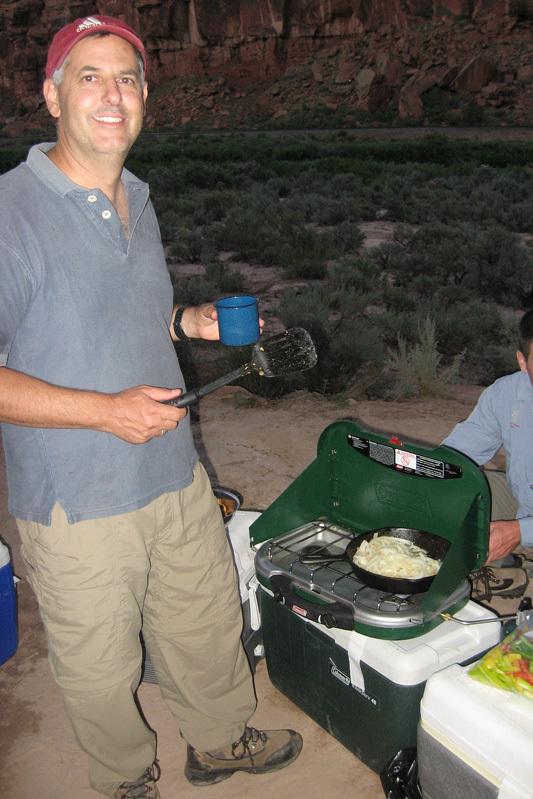 Day 3 - The day started with another 6:00am wake up call (literally). 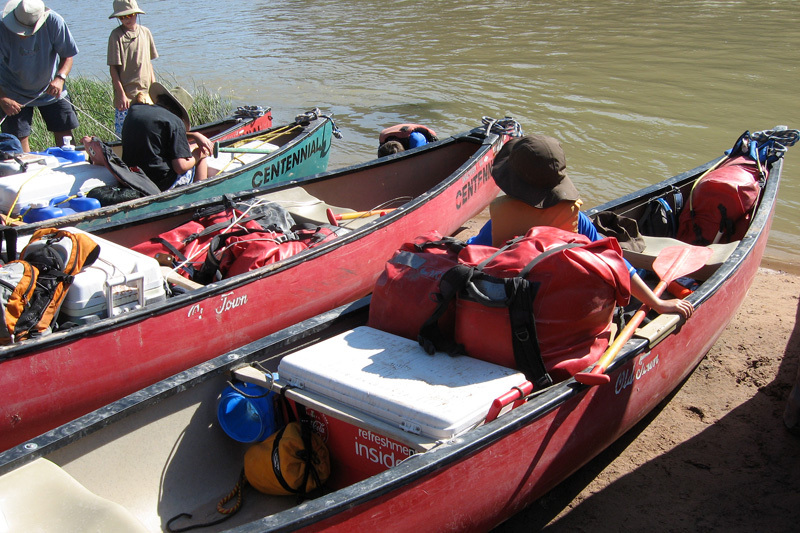 We broke camp and loaded up the canoes and headed out by 9:30am for the 20 mile paddle to the take out point. 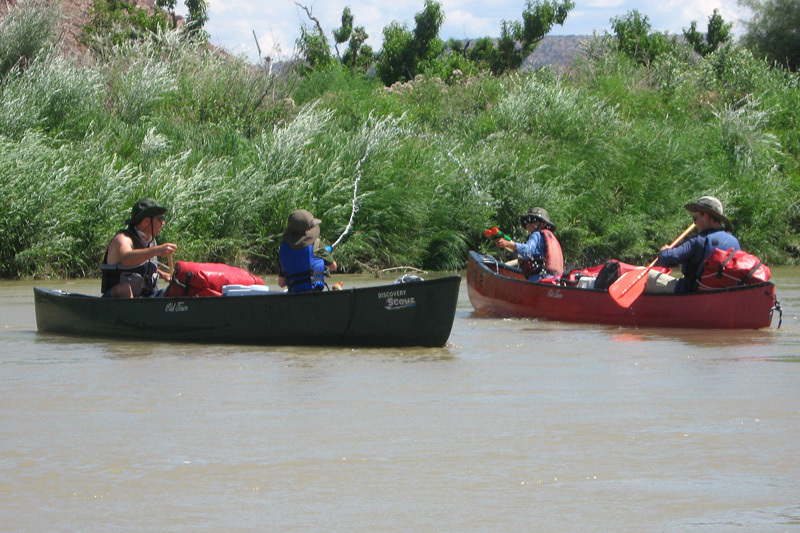 There were a lot more naval battles on this segment and we made great time because of all the chasing and attacking.